Read on for our ultimate list, but first, let’s discuss the features we looked at and how we made our selections. Before you choose a theme, it’s always a good idea to look around at the competition. What are those sites doing? Whom do you want to emulate? One of the most important features you should consider is eCommerce integration, for which WooCommerce is the most popular choice on WordPress sites. Other factors that make a theme a great fit for an eCommerce site include product sliders, sales or news notification banners, product variation options, and social media integration. 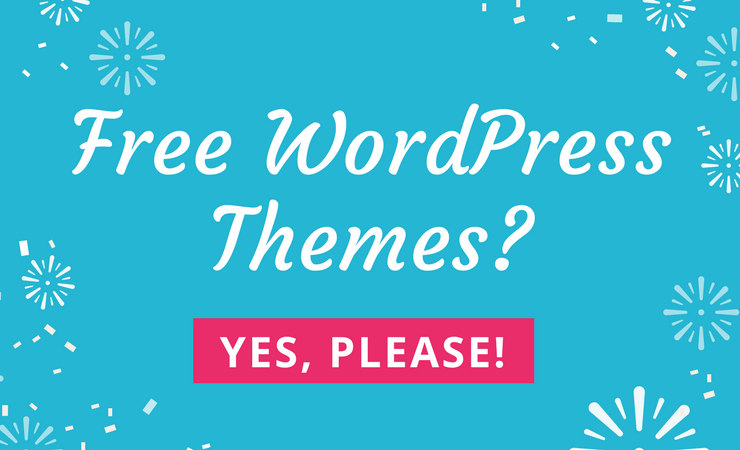 What Sets These Themes Apart? The themes on the list below include the features mentioned above but they each bring something extra to the table as well. Some have a bit of added style or extremely lightweight code. Others have support for full-width, high-resolution photography or interesting layouts and menus. All of the themes included here are special and worthy of your consideration. This genre of WordPress themes is a constantly shifting collection of styles and features supporting a spattering of commerce plugins or 3rd party processors. As such, we’re constantly trying to update this collection to keep it fresh. Please let us know if you notice that we’re missing a theme that should be included. 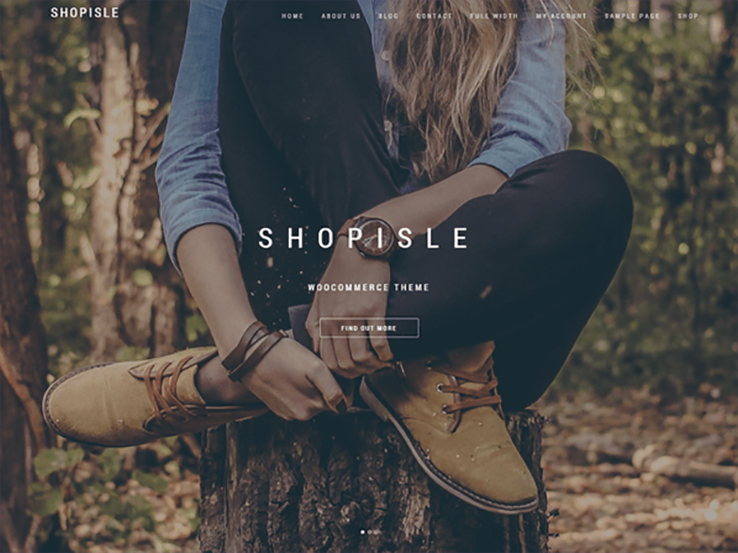 ShopIsle is a beautiful ecommerce theme with a stunning parallax header that’s sure to capture the attention of your visitors. As an added bonus, you can add a text overlay to the header, along with a call to action to send people directly to your most popular products and collections. With this theme, you can share a list of things people can expect from your store such as an immediate link to a promotion or a special collection. You can then follow it up with a grid layout of recent additions to the shop and feature your seasonal offers to boost your sales during peak shopping seasons. The custom menu provides easy navigation around your shop and the shopping cart icon lets your customers double check which items they have selected. This theme is fully responsive and cross-browser compatible to ensure maximum compatibility with all devices and browsers. The clean code ensures there are no security vulnerabilities on your website. ShopIsle boosts your SEO, especially if you include a blog to talk about the process that goes into making your products. The entire theme can be customized on the backend, from colors to fonts and you can use the translation files to make your store accessible to people all over the world. Designed and developed by the Themegrill team, eStore is a fantastic eCommerce template, complete with wishlist features that allow your customers to save collections of their desired products for future purchase. It also includes a collection template that allows you to highlight different sets of products in a single page and boost your sales. In addition, you’ll get beautiful sliders to highlight specific products and categories. In terms of customization options, you’ll find plenty of color and typography options to match any style. You can set custom colors for different product categories and change the font size of almost every element. And since the eStore theme is responsive and multilingual, your online store will work correctly on all devices and screen sizes, and you’ll be able to reach people in different languages around the world. Consider the Brutal theme if you’d like a modern and flexible theme that works with the Genesis Framework. 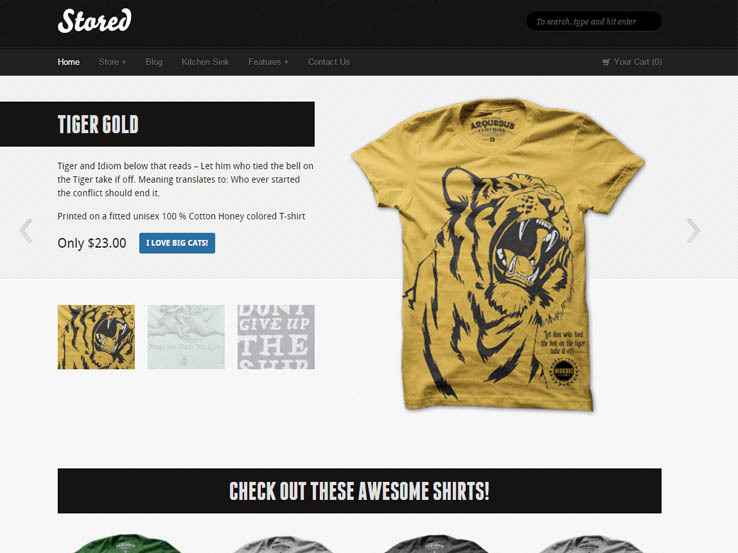 The theme also integrates well with WooCommerce so you don’t have to pay for your shopping cart. The responsive design works on both tablets and phones and the large header/slider allows you to include call to actions which send people to your most popular products. Include a Contact page so your customers can easily get in touch with you and create your own blog to improve your SEO rankings and share shopping tips with your audience. The theme has parallax effects which add creative flair to your photos, along with an area to feature your team members. This module includes social media integration, pictures, and descriptions to give your staff the credit they deserve. An interesting part of the theme is the filterable portfolio, which doubles as a place for people to filter high-resolution photos that lead to categories for your shop. Divi is included in many of our lists because it’s so versatile; it’s a fantastic choice for any type of website. It has all the bells and whistles you could ever want in a WordPress theme, including a drag-and-drop editor that makes customizing incredibly easy while giving you detailed control and editing capabilities. 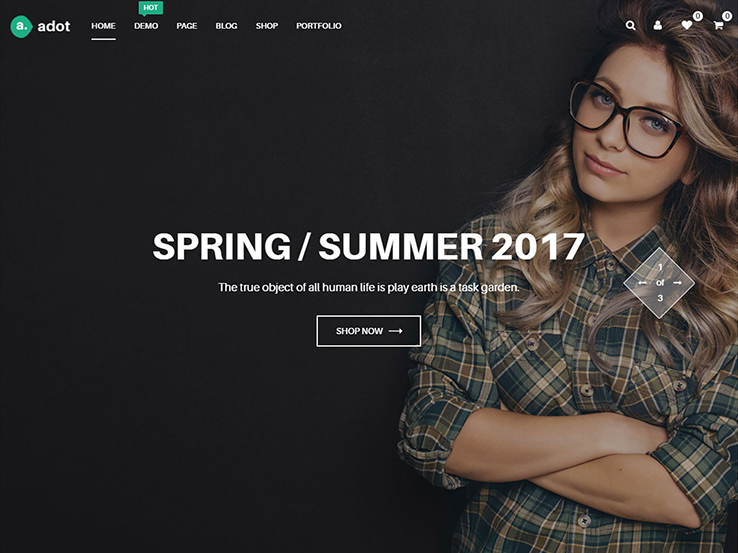 This theme also comes with awesome page templates so you don’t have to re-design the theme from the ground up to get the look you want. It’s a great theme for tweaking every inch of your site with small alterations. 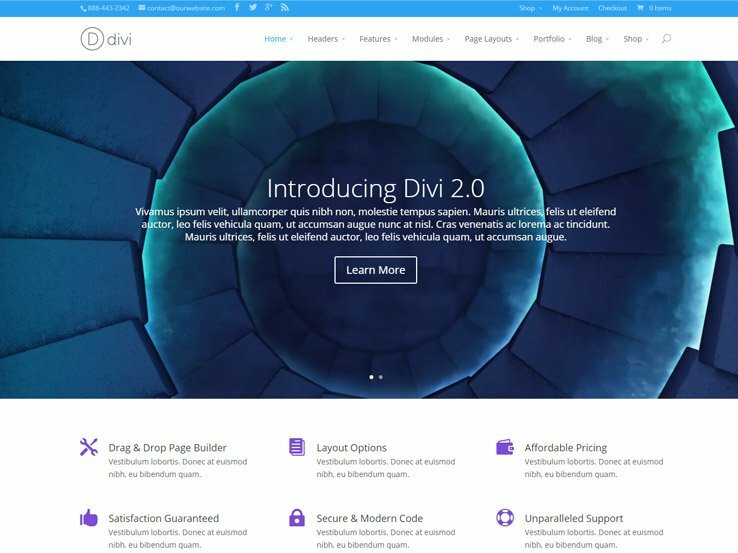 Divi is WooCommerce ready, elegantly responsive, and parallax and video background capable. With a plethora of options, the customization options are endless but if you don’t want to make a lot of changes, the demo page looks great too. 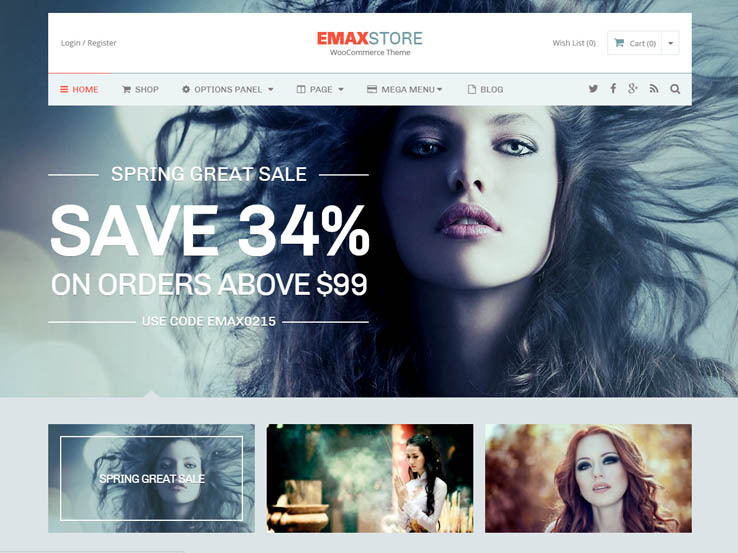 The eMaxstore theme from Mythemeshop is a very cool option. It uses parallax scrolling, which makes your site look fresh but not overwhelming, keeping the focus on your product, not how fancy your website is. It’s a young and hip theme that avoids being childish by using lots of clean space and organizing content in a practical, but interesting way. eMaxstore is a robust theme, perfect for anyone who is looking to build a eCommerce site with a large inventory and a wide range of products. It’s also compatible with WooCommerce, the preferred solution for most eCommerce businesses. The designers have done a spectacular job of creating tools for sorting, viewing, and shopping, including the ability to organize your products into unlimited categories and a comparison tool. There are almost as many customization options as ways for your costumers to shop, like the MegaMenu that looks so great in the demo and the Mythemeshop options panels which make customizing their themes simple and quick. There is also a blog option, which could be a lovely addition to connect your site with your target audience, but functions very well on its own. 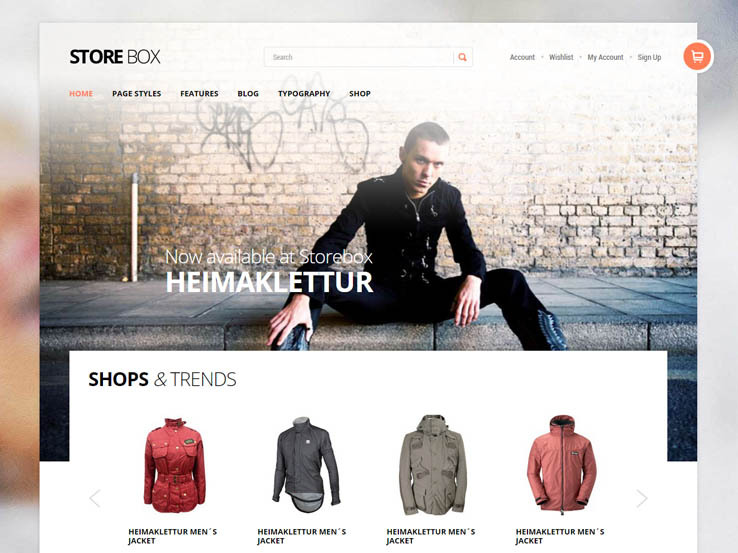 eMaxstore is also beautifully responsive, an essential feature in this age of mobile shopping. 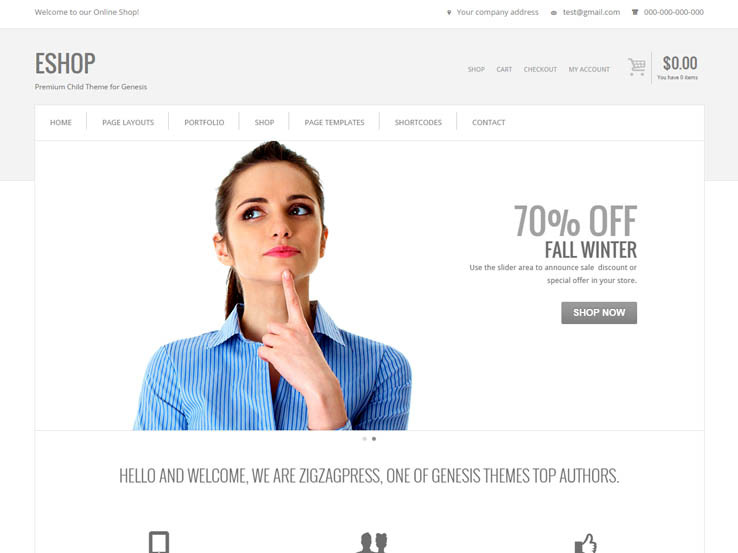 If you’re looking for a simple and clean platform with an amazing user interface that won’t distract from your products, The Eshop theme by ZigzagPress is perfect. If the all-white all-the-time look isn’t your thing, the theme also includes an incredibly easy Style Selector for editing the theme to better reflect your brand. Eshop includes a front-page parallax slider layout to showcase sales or featured items without distracting readers from the product listings below. The layout of the product listings are gorgeous and gigantic, allowing you to really showcase your goods. The theme also includes a very attractive and well integrated blog platform, an increasingly popular feature of Ecommerce WordPress themes. This blog in particular makes it incredibly easy to navigate to and from the shop so your readers can read about your products in your blog and stay within a click of purchasing any of your featured products. The theme’s grid layout is beautifully responsive and is compatible with the new and popular Gravity Forms plugin, allowing customers to get in touch with you in the simplest way possible. Eshop is compatible with WooCommere by WordPress, making it very easy to track and collect your earnings from purchases on your site. 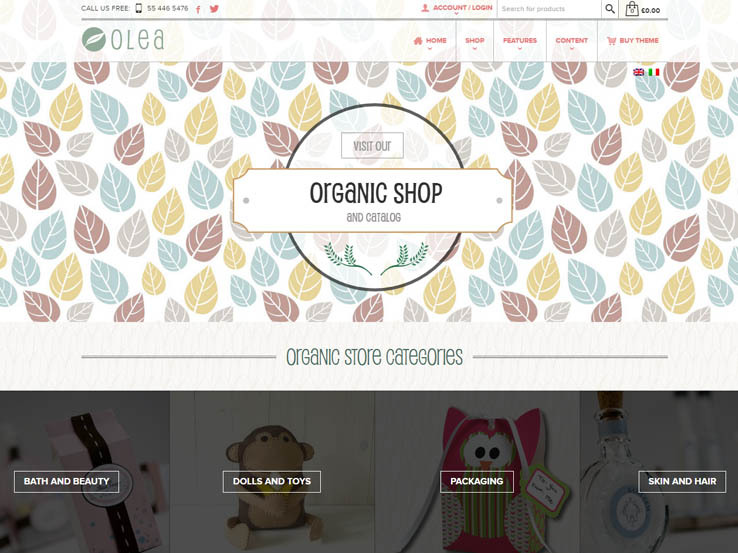 It makes excellent use of white-space, so the focus is your shop, housed within a simple and easy to use theme. Diamond is great for a site with a shop as a secondary focus and, with huge image windows and beautiful sliders, it is ideal for a site with lots of images. 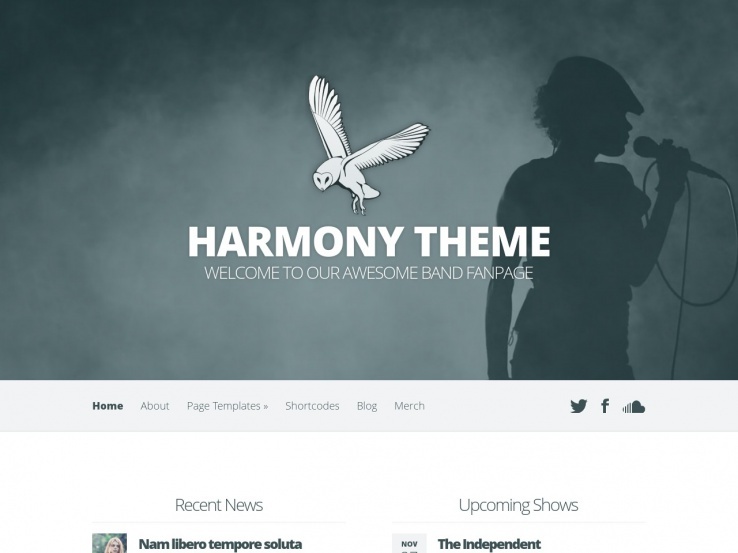 This theme has a simple and clean design with a large front page slider and seamless social media integration. You can connect with your visitors on their preferred social media platform while offering them a great looking theme that is WooCommerce compatible to sell your products. Diamond is easy to set up with multiple front-page template options or the WPzoom Zoom Builder to create a new template yourself, without using any code. Like the Diamond theme discussed above, Harmony is well suited for eCommerce integration but that isn’t its main focus. 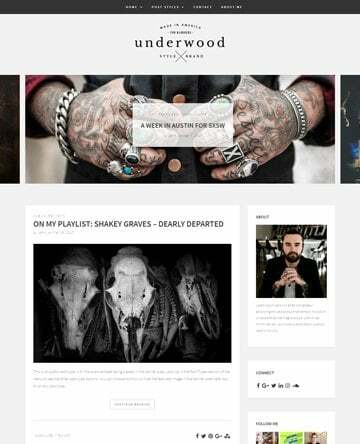 The theme is primarily marketed towards bands, with amazing media integration for both audio and video, but you shouldn’t let this deter you if yours is not a music focused site. Harmony is also great for any business that works with a lot of video and, with WooCommerce compatibility, also works well for selling products as a sideline. This theme would a perfect fit for a non-profit organization featuring event videos that also sells t-shirts and memberships, or an artist with video of their creative process. This theme features a large banner on the front page and a simple, clean format to deliver a lot of information, media, and products without overwhelming your readers. It’s also beautifully responsive on any screen and easily customized with the Elegant Themes epanel and shortcodes. Kancying is a classy looking theme from Tokokoo, who are well known for integrating parallax and sliders into their eCommmerce themes in a clean and dynamic way. It’s marketed as a portfolio theme as well as an eCommerce theme, and you can really see why when you look at the demo. The stacked grid layout for the products may not work as well if you have a large inventory but it would be very eye-catching for art or photography. Kancing comes with amazing features to create the perfect website. It is WooCommerce compatible, translates into multiple languages, and is beautifully responsive. The Tokokoo Theme Customizer makes it easy to customize the theme to reflect your style without having to write any code. The Blog section is also notable, allowing you to share both audio and video files in a lovely format. 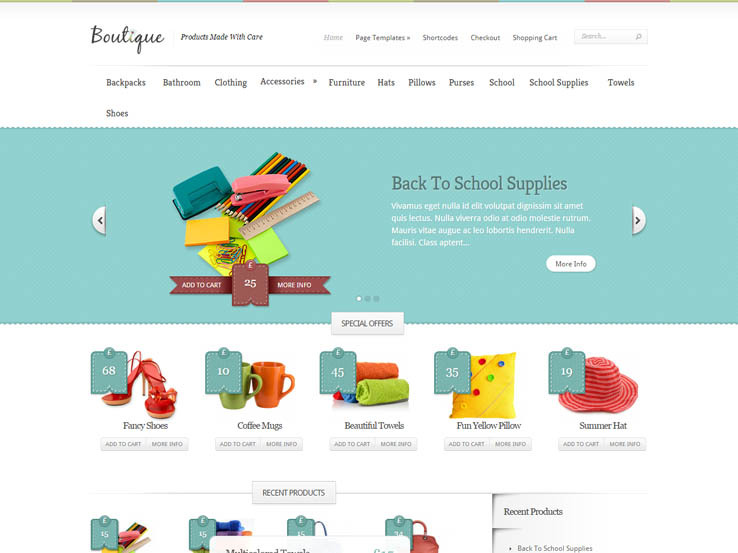 The Estore theme is an outstanding choice for someone who is looking for an eCommerce site with a little grit to it. The aesthetics are a bit rustic and would be perfect for a business that sells outdoor gear or features nature photography. The design comes with multiple template options and the easy-to-use ePanel so it can be edited to your liking. With Elegant Themes, you get access to a large collection of shortcodes to truly make the theme your own in the simplest way possible. Overall, Estore is extremely pleasing to the eye with a neutral color scheme interspersed with pops of colors to highlight featured items in your store and make you stand out from the competition. One of the great benefits of Schema is that, like all themes from Mythemeshop, it has excellent built-in SEO optimization. Tons of hidden code is included to help Google find your keywords and get people to your site. You just have to remember to type directly into the theme instead of uploading your text as images styled in Photoshop. 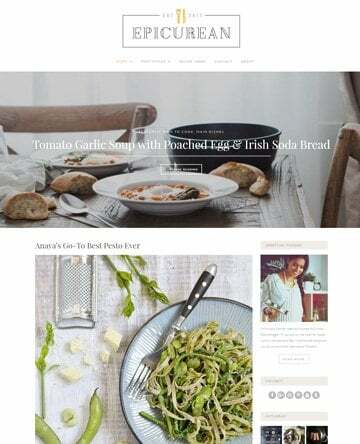 This theme is fully responsive so all of its elements – the fantastic blog layout, clean grid display, and excellent sidebars for showing related and featured products – will look amazing on all devices. Schema also includes a built-in Ad Manager to track earnings from in-site advertising which is great for making a little extra cash. The translation files included with your purchase make it easy to translate your entire website and the options panel editor will enable you to refine your style effortlessly. If you happen to be a more experienced coder, you can use your own custom CSS to make your site even more unique. Boutique is the perfect theme for all you Pinterest addicts out there. The design is geared toward a more handmade look and would be perfect for any site with arts and crafts or one-of-a-kind products. 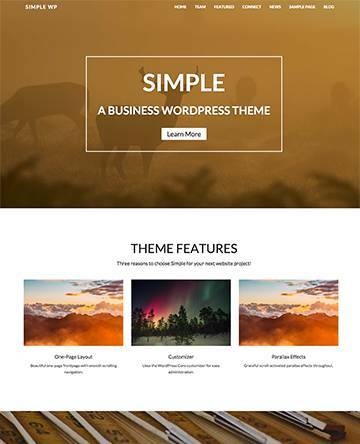 This theme also comes with all of the bells and whistles you’ve come to expect from Elegant Themes, including SEO optimization, responsive design, multi-language capabilities, the Options Panel for code-free styling, and WooCommerce integration. Boutique also offers page templates to add variety to your website and as a bonus: look at those adorable little price tags! KALLYAS has a unique name and is a stunning option for building a similarly one-of-a-kind eCommerce website. The amazing page builder makes it easy for webmasters of all skill levels to add logos, change colors, and optimize each of the products you have for sale. Unlimited colors and headers are included, to help you create a memorable brand, and you can use the six homepage styles, three portfolio layouts, and many custom pages to keep your site exciting. The various slider options make it easy to display sale items or new products at the top of your homepage; you can also use them for calls to action or links to your seasonal products. The WooCommerce integration is standard and quick to implement on this fully responsive theme which is also SEO-ready, translatable and packed with features to get your business up and running today. 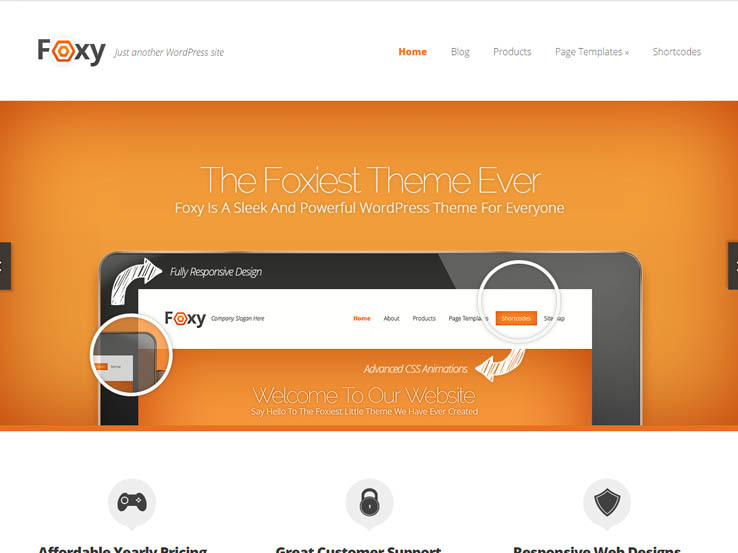 Foxy from Elegant Themes will add a little sexiness to your eCommerce store with its bright colors and sleek designs. The idea behind this theme is to give customers a fun and exciting experience, while also focusing their attention on buying your products. The unlimited color options ensure that your website matches your brand perfectly and the sliders, social media support, and striking product pages will encourage visitors to explore and buy more. Your site will be accessible to all shoppers with Foxy. The localization options enable you to reach people from all over the world, integrates well with most eCommerce plugins, and runs perfectly on all mobile devices. Foxy provides various page templates and shortcodes, each of which minimizes the time you need to spend on designing your own unique website elements. Instead, just drop a shortcode on your page to generate elements like columns or buttons. You can also take advantage of the widgets, which work nicely in footers and sidebars, allowing you to incorporate modules for About pages, Services, and more. The X Theme is one of the more functional and popular multipurpose themes on the market. It’s beautifully designed and it caters to a wide set of niches, from churches to restaurants, and eCommerce shops to agencies. 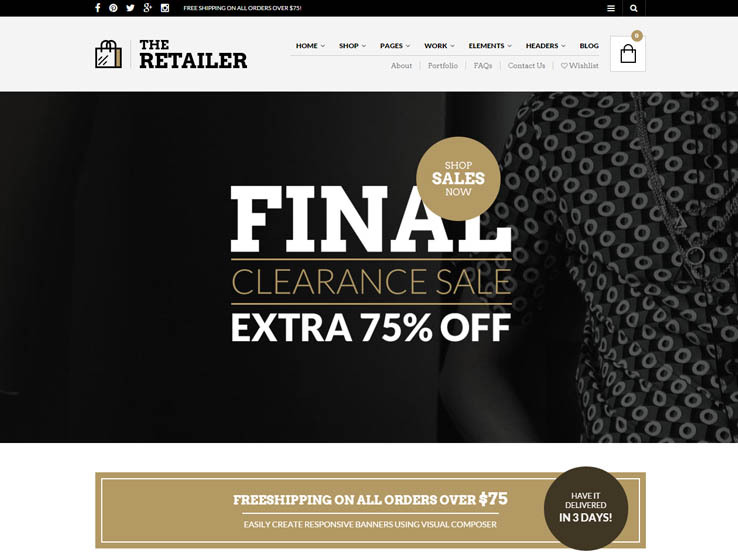 The theme integrates rather well with WooCommerce and it has four unique shop designs to choose from. The theme is also responsive and includes various icons to highlight any section of your website and add extra visual appeal. A drag-and-drop page builder makes it easy to customize the page layouts, while the clean thumbnail images help boost your sales. The theme has an elegant menu which makes navigating your website easy and you can even turn the theme into a one-page site, consolidating all of your product listings into one area. The mega-menus are a must have for large eCommerce sites, while the search functionality brings a whole new dimension to navigating through your website. The X Theme provides interesting typography options which allow you to choose the fonts that compliment your brand. You’ll notice that many eCommerce websites are complemented with other types of community-based modules to increase user interaction and boost their conversion rate. That’s why the X Theme has integration possibilities with a wide set of third-party plugins. You can create forms on the backend for keeping in touch with customers and the bbPress integration allows you to add a forum which you can use to provide immediate customer support. A social network in your online store is not out of reach either. Simply implement the BuddyPress plugin to generate profiles and messaging options for all your visitors. Along with tons of shortcodes, PSD files, demo data, and the Revolution Slider plugin, the X Theme is one of the top themes for online stores. 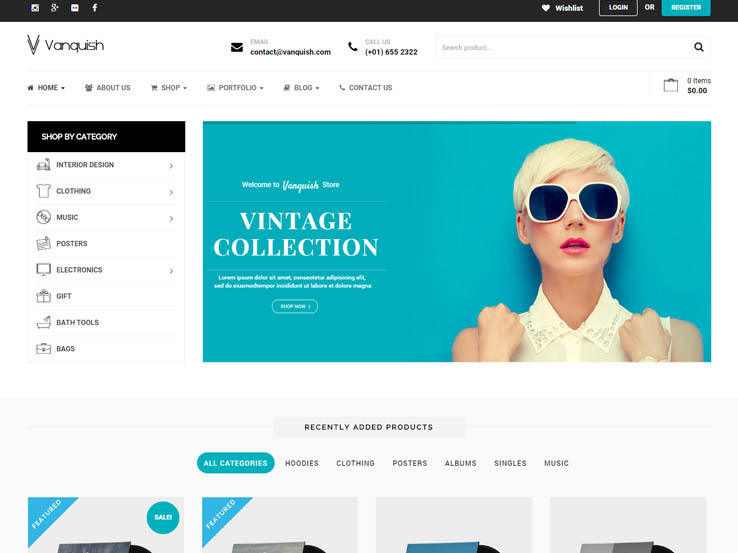 The Vanquish WordPress theme is the quintessential eCommerce option, with a clutter-free, white background and powerful premium plugins for customizing your site the way you want. This theme includes 11 pre-built layouts that can be imported with one click, which reduces the time you would need to set up your website. The Visual Composer is the ideal building experience since you only have to drag and drop components and modules, instead of messing with code. The parallax-ready features ensure that your customers will be blown away by the first page they land on. They will continue to be impressed by the three different product display options, which are a great way to differentiate yourself from competitors, and the Revolution Slider. This plugin is perfect for displaying your most recent promotions in an animated and appealing way. The built-in mega menu is another must-have for all eCommerce sites, allowing you to include multiple products and categories without overwhelming your visitors. The Flat Responsive WooCommerce theme delivers on what it advertises. It’s flat, responsive, and WooCommerce-ready for an incredible user experience based around some of the most modern eCommerce websites. It will ensure that both you, the admin, and your customers feel comfortable. One standout feature is the parallax banner, which is a great way to capture visitors’ attention. Another is Catalog Mode to hide the shopping cart checkout function, keeping the page clean. The demo content is included in your download, which is a huge plus because it means you don’t have to spend time figuring out how to build your site from scratch. More advanced webmasters will also be happy to know that the PSD files and assets are all included, so you can customize the design to suit your needs. The drag-and-drop page builder is especially useful when working on huge eCommerce sites with tons of products. This theme is also search engine optimized, so your products and blog posts ping the best search engines with minimal effort from you. 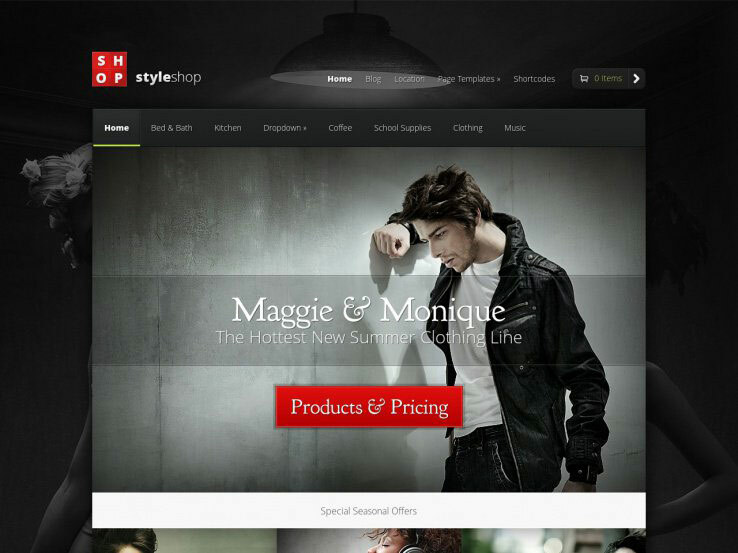 The StyleShop theme provides a wonderful interface for people interested in making eCommerce shops. It has a responsive design, ideal for mobile devices and a beautiful background which you can swap out to better reflect your company’s branding. A variety of shortcodes make it easy to design your site without using source code and templates for pages like contact forms, portfolios, image galleries, and login pages will help make it something really special. StyleShop also provides several widgets for implementing anything from an About Us page to contact forms. The drop down menus enable you to add as many pages as you need and you can also add buttons to slider images to send people directly to the individual product pages. You can feature offers and new items with thumbnails and showcase all of your best products with links, images, and pricing information, all on your homepage. The slider is also a great way to share new promotions or products and the fixed-width layout helps to put the focus on the content in the middle of the page. 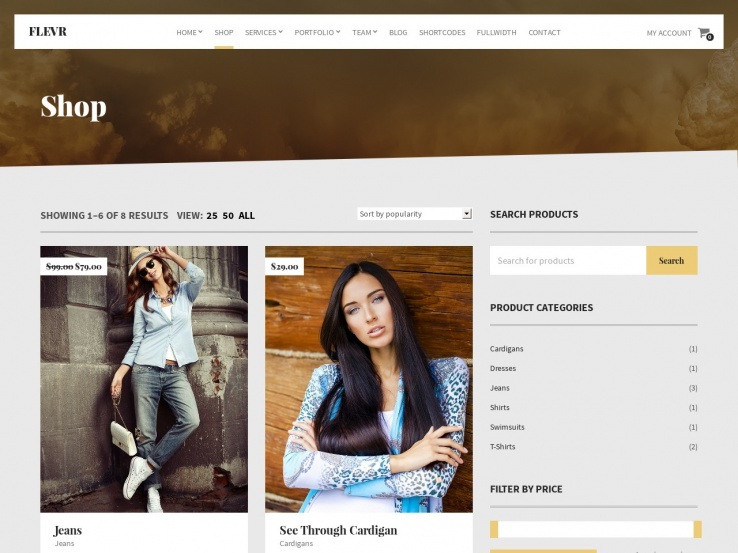 Along with a stunning design, a simple admin panel, and various ways to sell your products, StyleShop is definitely one to seriously consider when choosing your theme. The Suave theme is a beautiful, premium WooCommerce theme meaning you can sell both physical and digital products with ease. It offers plenty of space and style to show off your most recent products and has a responsive interface, giving users the convenience of shopping from their phones and tablets. 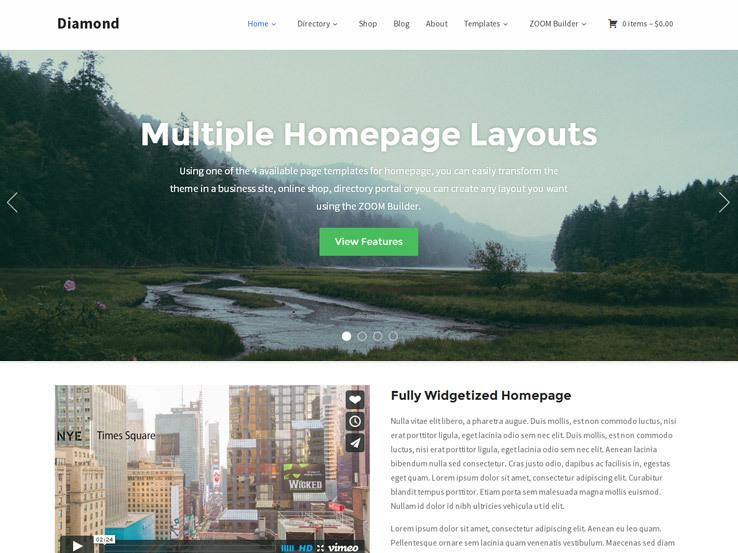 This theme comes with a few different homepage layouts, three header styles, and nearly 100 theme options to help you stand out from the competition. You can also modify product details with everything from product ratings to pictures and customize the gorgeous content pages to add stylistic elements to your site. Several exclusive plugins are included, such as Visual Composer and Layer Slider. The slider is ideal for showcasing products, while the Visual Composer plugin helps you create complex layouts throughout your website without the need to code any of the modules. Multi-currency support and translation features will allow you to reach a global audience, making Suave a fantastic choice for a company with big goals. 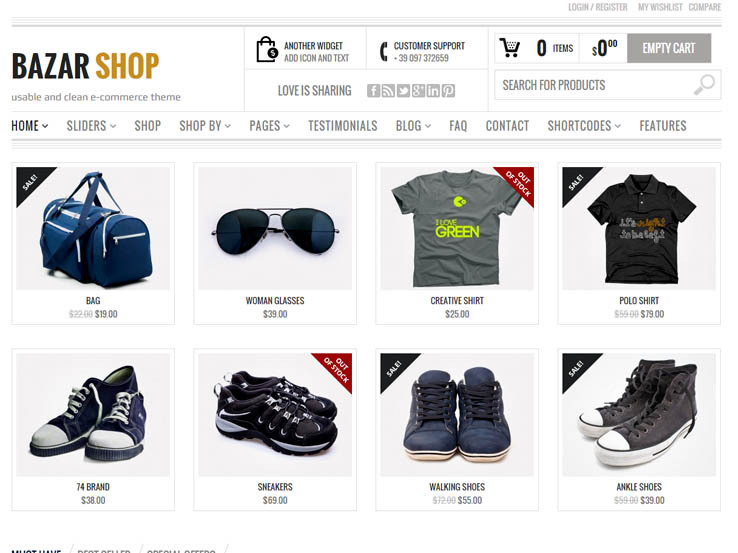 The Azshop theme ranks among the best eCommerce themes with its integration with the top plugins for selling online. The WooCommerce plugin allows you to sell various products while the Slider Revolution plugin helps you build beautiful sliders that showcase your promotions and events. This includes some awesome ways to incorporate animations and other design elements that grab your visitors’ attention. You also get the Visual Composer plugin which helps you build custom layouts through a drag and drop process, without the need to touch a single line of code. AzShop is incredibly versatile, able to adapt to a variety of niches and industries like auto, tools, electronics and fashion. The layouts are easy to customize from the backend of the WordPress interface to create a unique look that’s all your own. This theme also includes a mega menu to pack a multitude of products into your menus without overwhelming visitors. The full blog included with the theme is perfect for sharing tips and tricks with your customers and for boosting your search engine rankings. With a one-click installation and thorough documentation, AzShop is a solution you can rely on. 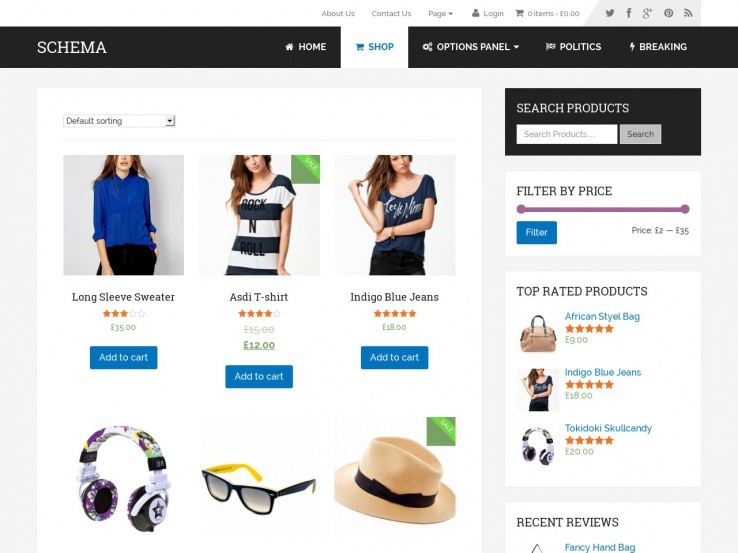 The Agora WordPress theme from the folks at CSSIgniter provides a wonderful eCommerce theme with a responsive design and user-friendly format. 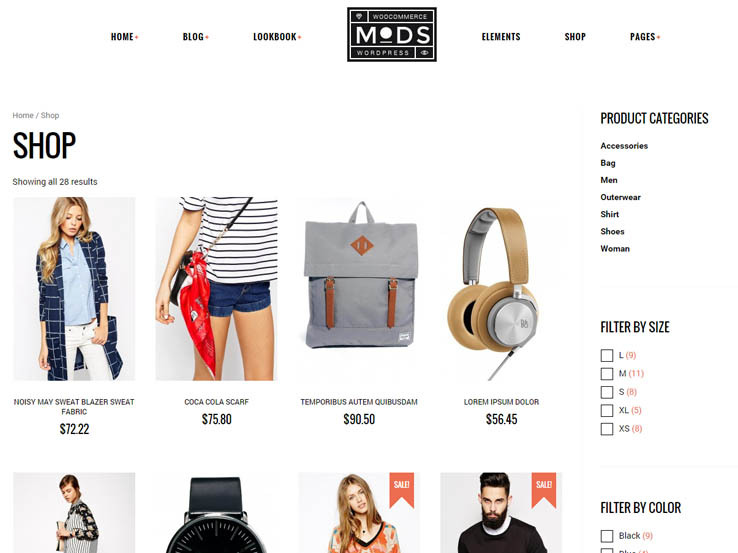 The entire theme is built for the WooCommerce plugin so once it’s installed, you can upload images, product descriptions, and other details and you’re ready to begin selling. Several payment processors are supported through the plugin, for a worry free sales process and the search bar is a major bonus to the user interface. The custom widgets are great for adding social media buttons and links to recent posts for a full access customer experience. You can also add your contact information in the header so your customers can easily get in touch with you. The slider enables you to show off new products, seasonal offers, or products on sale and the full blog is ideal for boosting your search engine rankings. Agora also allows you to upload your own logo and change colors and backgrounds to fit your brand. The MayaShop WordPress theme is an incredibly flexible eCommerce theme with an unlimited number of colors and backgrounds and over 300 Google Fonts to help you establish your brand. Two premium sliders, which average a cost of $110, are included free with your purchase and are perfect for showcasing new products and events. You can also add animations and fun transitions with the help of the backend settings. This theme comes in a boxed or stretched layout and the option to implement a child theme to improve customization options. MayaShop has great SEO tools built right in, allowing you to devote your time to managing inventory and marketing, not boosting your SEO. The responsive design is another must-have feature, especially for eCommerce websites. With social icons, translation features, and beautiful banner solutions, MayaShop allows you to start selling as quickly as possible. Overall, this is one of the best themes on the market. Consider the Adot theme if you’re looking for a clean, modern, and powerful template to launch your eCommerce website. Based on the WooCommerce plugin, the template comes with over 9 pre-made designs to choose from, a user-friendly cart and checkout experience, a wishlist, shipping options, product carousels and sliders, and support for several payment options. The reviews and ratings system is perfect for adding social proof, while the blog will help generate more traffic to your store. Besides, you’ll find a portfolio to showcase your previous works, a drag-and-drop page builder, hundreds of fonts, and unlimited colors and skins to match your style. 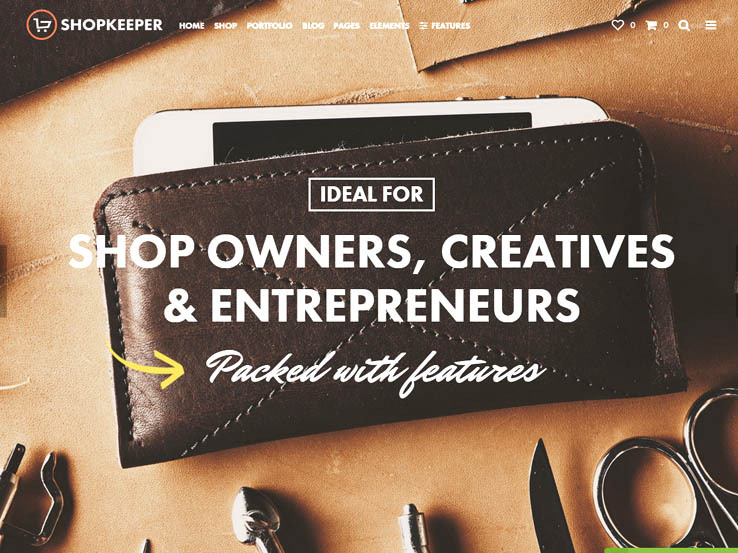 The Shopkeeper theme has become one of the most talked about eCommerce themes on the market with its many pre-built page layouts that enable you to make your website look different, even from others who have bought the same theme. It has an unlimited number of available header styles for featuring new products, blog posts or events, each with a distinct look. 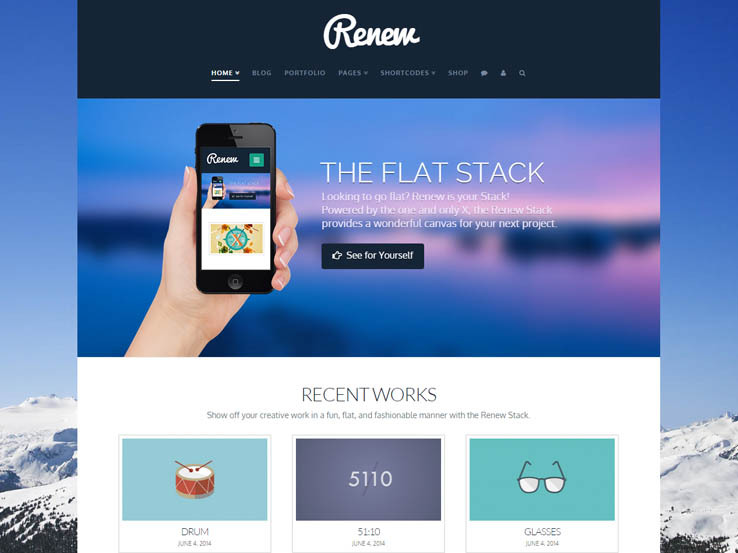 This theme also supports high-resolution photos in the headers to present your products in the best light possible. The portfolio feature is one of the high points of this theme. With it you can arrange a large number of products into a grid or tool to display your wares. With Shopkeeper, you can sell both digital and physical products, collect payments from customers, and manage your inventory. 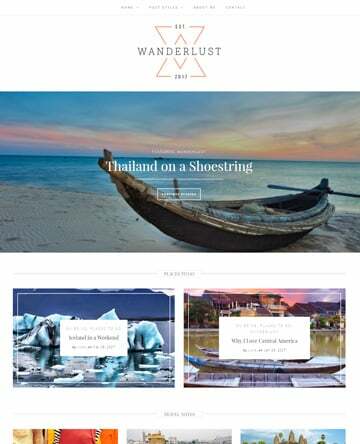 A stylish blog comes with the Shopkeeper theme as well, boosting your search engine optimization and allowing you to connect more directly with your audience. Another bonus is the Revolution Slider plugin, which is included in your purchase. With options to add animations, overlay items, and much more, you can see why it usually sells as a premium plugin. All of these features plus a responsive design and great support documentation makes Shopkeeper a must consider eCommerce theme. The Bazar Shop theme is one of our favorites for building an eCommerce website because it has tons of settings on the backend and allows you to display lots of content on the frontend. You’ll notice that the designer put a lot of the focus on creating conversions with site visitors, like the top slider images for promotions and the product listings at the bottom, showing both recent and popular items. Customers will always be sure of what they’re buying with the zoom effect and testimonials, which you can add to one of the many widgets. Buttons, columns, and many other design features are also easily added with shortcodes. Bazar Shop comes with a popup plugin which you can use to add an email popup subscribe form for building your email list. The social media buttons are another great way to connect with your clients. Two custom checkout pages are provided but if your goal is to guide people toward a physical store, you can turn off the shopping cart feature and change your site into a catalog. This theme and its responsive designs are completely customizable and guarantees a gorgeous result. 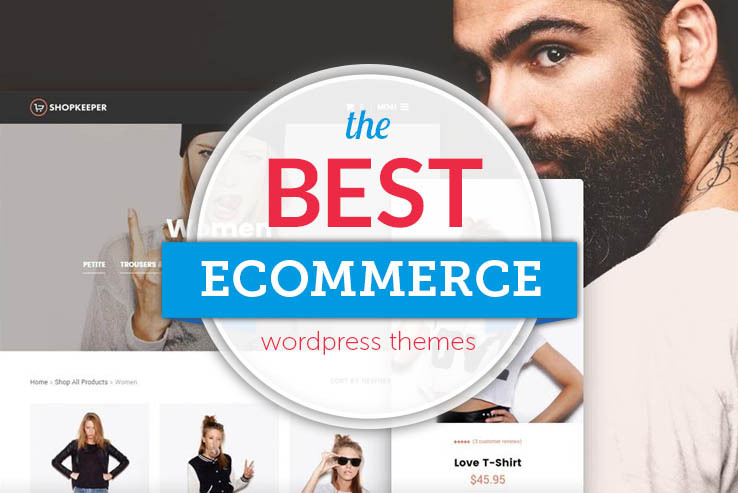 In fact, we’d argue that this is one of the most beautiful eCommerce themes on the market and it integrates with WooCommerce flawlessly as well. Rustik is a clean and minimal eCommerce theme that puts the spotlight on one product at a time through a homepage that is made up of nothing more than a single slider. As visitors navigate further into your page, the shop page features your items in the standard grid layout with options to sort items by rating, price or popularity. A custom menu provides links to different product categories and can be expanded to include links to your shipping and return policies and FAQ page as well. A search bar is available to help customers find what they’re looking for faster and the ability to translate your site into 40 different languages will help you connect with customers on a global scale. The responsive design keeps your site looking great even on phones and tablets to make your business even more accessible. The blog page will keep customers up to date on your latest news while also increasing your search engine rankings. The email subscription module, which integrates with MailChimp and Aweber to collect email addresses, is another outstanding way to stay in touch with your customers. 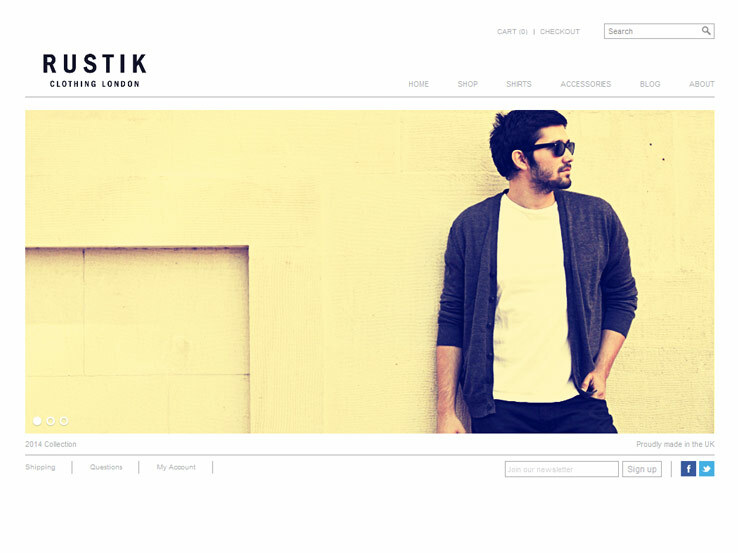 Rustik’s options panel features over 160 customization options which makes customizing this theme a breeze. Seventeen widget areas provide a drag-and-drop interface to easily place widgets wherever you want them. Your purchase will also include extensive documentation and video tutorials to get your site up and running in no time. 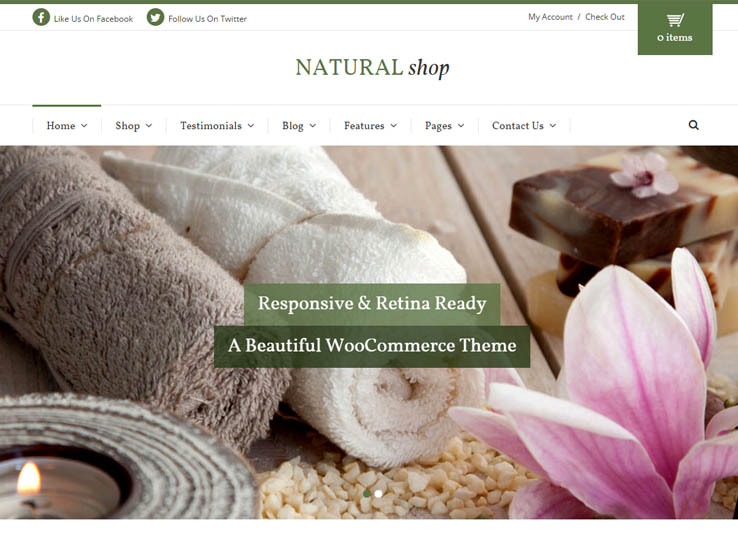 The Natural Shop theme has a solid structure for organizing your products and stylishly displaying them for customers to browse. It integrates seamlessly with the popular WooCommerce plugin to make uploading products, inserting images, managing your orders, and collecting payments effortless. The unlimited color schemes and Google Fonts allow you to brand your online shop and build brand recognition, all of which will look amazing on phones and tablets thanks to the responsive design. The Nature Shop also comes with demo data which can be imported with one click to reduce the time needed to set up your website. You can replicate pages you find in the demo, expediting the creation process and making it much easier to start selling within hours. Once your website is fully functional, integration with Google Maps, Instagram, and Twitter will make it easy to connect with your customers and provide them directions to your physical location. This theme also comes with translation-ready files, several PSD files, and much more for a fantastic WordPress experience you won’t want to miss. The Retailer is sure to impress your visitors with its huge video background in the header. This feature which will be even more impressive with the addition of overlaying text and buttons to direct customers straight to a particular product or category of products. You can display products on one of the multiple homepage layouts by popularity, showcase different categories, and sell affiliate products together. There are several different layout options available for individual product pages, any of which you can easily tweak with the Visual Composer plugin. The drag-and-drop function allows you to make changes by simply dragging the desired element onto your page. 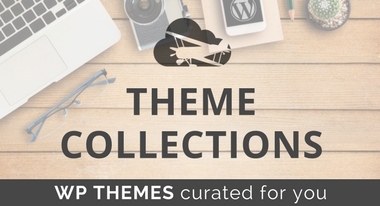 The theme options panel is another must have tool for styling your website. The Revolution Slider is included with The Retailer, to create beautiful slideshows featuring your products. There are also several page templates for providing information about your company, featuring members of your team, and allowing customers to track their orders. A prominent cart button ensures that your customers know exactly how many items they’ve selected and the blog page will keep them up to date on all your latest news. You can even embed a Google Map to provide directions to your physical store. 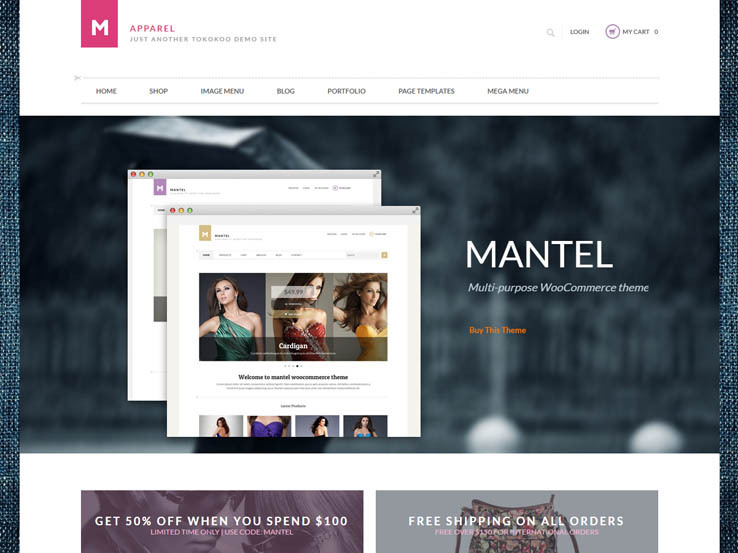 Amaryllis, from CSSIgniter, is an elegant theme for all companies looking to build an eCommerce website. With WooCommerce support and a drag-and-drop interface, it only takes a few clicks of the mouse to design a simple site and start selling online. The custom widgets are nice for adding anything from Flickr widgets to recent post modules on your site. Amaryllis includes JetPack support and the fluid SEO optimization ensures that your company is easily indexed by the search engines. With black and white color scheme, the theme offers an elegant take on the online business world and the beautiful blog design allows you to easily share industry news and tips with your audience and to boost your search engine rankings. Along with a Contact page, social media buttons, and a newsletter signup form, the Amaryllis theme provides all the tools you need to start selling online. Herringbone works with WooCommerce and it offers a more feminine take on the standard eCommerce theme. The theme includes various custom widgets for features like social media modules and recent post lists. Multiple color schemes allow you to easily change the default colors and create your own style. A notable feature on Herringbone is the stylized email subscription form for building your email list stay in touch with your past customers. The theme also includes various shortcodes, a full blog, a Contact page, and some pretty cool design options to make your site look exactly the way you want. WooCart is all about eCommerce since it’s built for the WooCommerce plugin, allowing you to sell digital and physical items through your website. The unique design is fluid and responsive which is an essential feature for eCommerce websites. The AJAX “add to cart” module is one of the smoothest we’ve seen and filters work wonders for guiding your customers to the most relevant items. 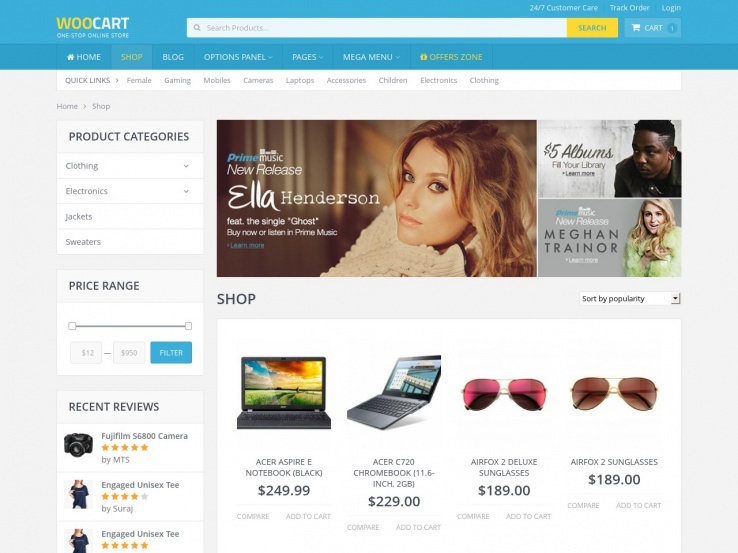 The WooCart theme has a unique design that’s built to guide customers through a smooth sales process, prompting them to buy more often. The beautiful homepage features a stunning slider along with customizable colors so you can easily incorporate your own brand. The drag-and-drop homepage editor makes it easy to customize the layout of your homepage. The unlimited backgrounds allow you to further customize the look of your website, while the mega-menu allows you to add all the important pages and categories without overwhelming your visitors. The WooCart theme includes an animated mobile menu so customers only see it when they click on it, which saves space and makes for a nicer user experience. 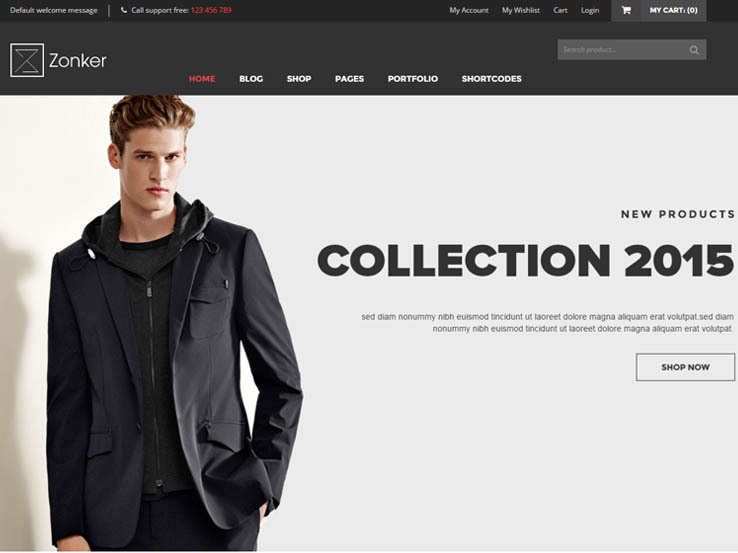 The Flat Responsive E-Commerce Theme says quite a bit in its name. You can assume that it comes with a flat design which is one of the most popular design trends nowadays. The default layout looks similar to the Zappos homepage which allows you to provide your customers with an easy checkout process. The responsive theme offers an incredible user experience and it’s packaged with a drag-and-drop page builder. The page builder allows beginners to easily adjust the layout of their pages without any coding knowledge while more experienced users can use it to save time. The Flat Responsive E-Commerce Theme is fully WooCommerce-compatible and it includes online documentation in case you need help with the setup. This theme has an interest Catalog Mode which lets you hide the shopping cart and checkout functionality for stores that only want to showcase items and not sell them. A child theme is included with your purchase, meaning your customizations won’t get lost when the theme updates. 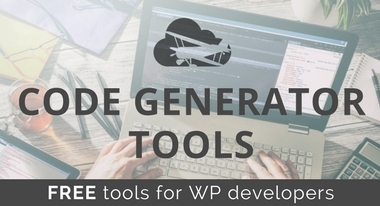 Import the demo content to make your site ready for sales within seconds and use the PSD files to make some powerful customizations. Parallax and video banners are perfect for grabbing the attention of your customers and Google Fonts allow you to easily customize the typography of your website. The Flevr WordPress theme has a grayish color scheme by default but it can easily be customized on the backend. The drag-and-drop editor makes it easy to customize any of your pages without having any coding knowledge. This is especially handy for beginners but advanced users can take advantage of it to speed up the design process and save time. The theme includes seven content types which are easy to modify and they provide all the functionality an average eCommerce site would need. 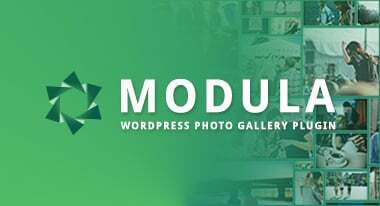 These content types include portfolios, services, and features modules, all of which use icons and smaller images to drive people to other parts of your website. You can highlight the best selling products in a portfolio or go into detail with your services. Feature members of your staff along with their bio and profile photo. Include testimonials from past buyers to build trust with potential customers and use the products gallery to boost your sales. 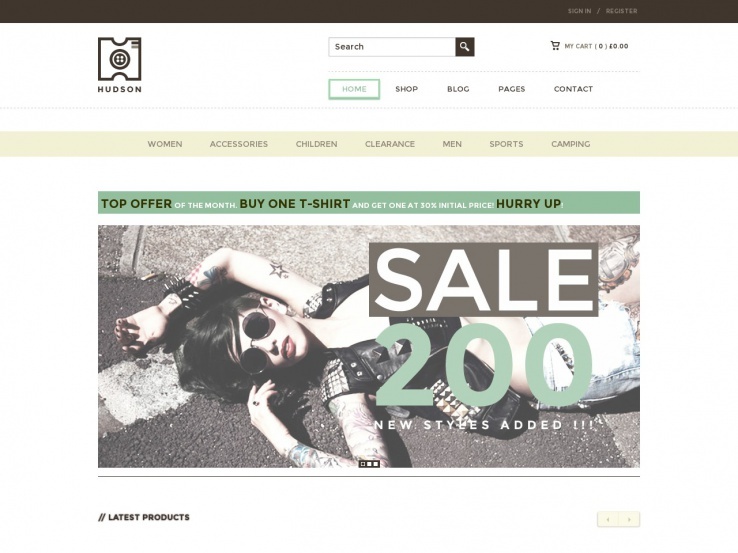 The Flevr theme is fully compatible with WooCommerce. Custom widgets allow you to add additional content to your website and you can place them in footers or sidebars to share your social media buttons or a list of your latest products. The shopping cart button is always in view at the top and the checkout process is fairly smooth compared to other themes. All products are highlighted with wonderful image support and you even get a cool email subscription form to stay in touch with your customers. With the Hudson WordPress theme, you’ll have both comfort and functionality and you’re bound to stick with it as your eCommerce solution for quite some time. The theme is completely responsive and it works with the WooCommerce plugin. This means that you can organize your products in a professional manner and collect money from customers by using a payment processor. The customization tools are rather impressive since you can upload your own logo and change the typography and the colors. The embedded map comes with custom icons, allowing people to find your brick and mortar store if you have one. There’s also a custom background to further customize your website. Social media buttons allow you to grow your social media following as well as allow your visitors to share your content across various social networks. 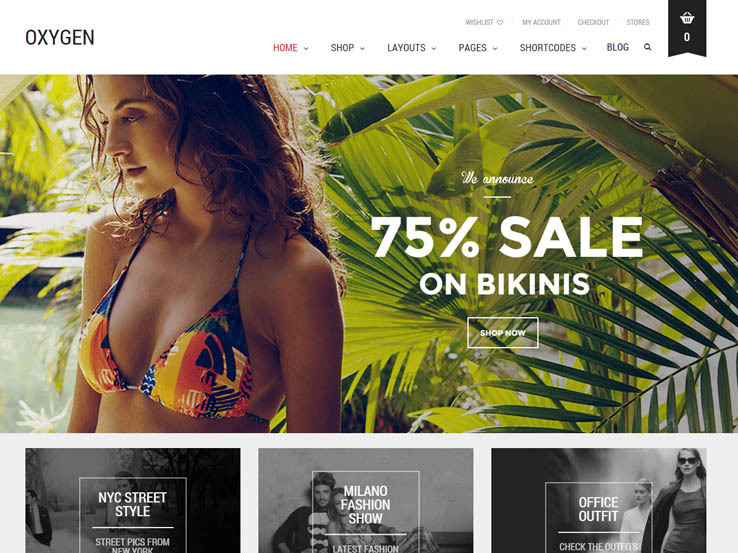 This premium theme has a lightweight, clean code with powerful features which allow you to create a stunning online store. The theme also includes a full blog template so you can share valuable content with your visitors and boost your search engine rankings. Overall, the theme is one of the best on the market, with a multitude of cool features on the backend. If you’re looking for cleanliness and modern flair, this is the one for you. 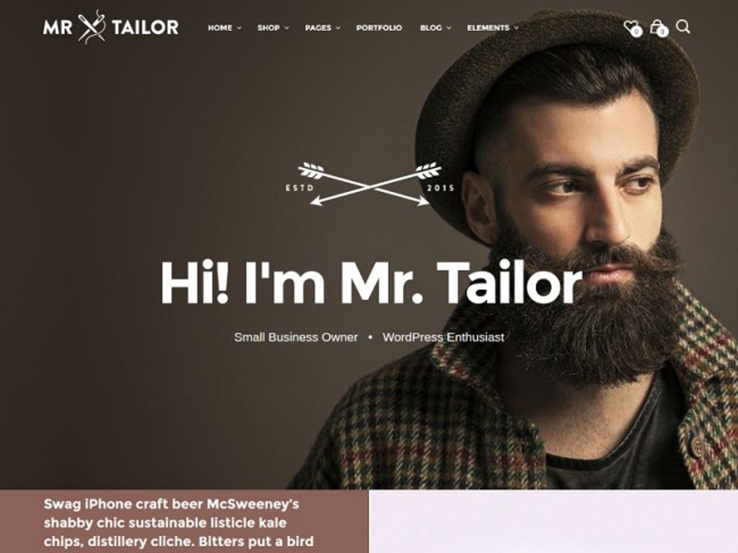 Mr. Tailor is a beautiful responsive eCommerce theme based on the WooCommerce plugin. It offers a modern and powerful online shop management solution. Use it to sell any kind of product online; whether digital or physical. The template includes a feature to handle different product variations such as color and size, a customer reviews module for social proof and to boost sales, and the ability to sell in your language and currency. In addition, you’ll find a variety of in-built payment methods including Paypal, cheque, and credit card. You’ll also love the in-built reports feature that allows you to monitor the performance of your store and the powerful customization options that make it easy to brand your store. 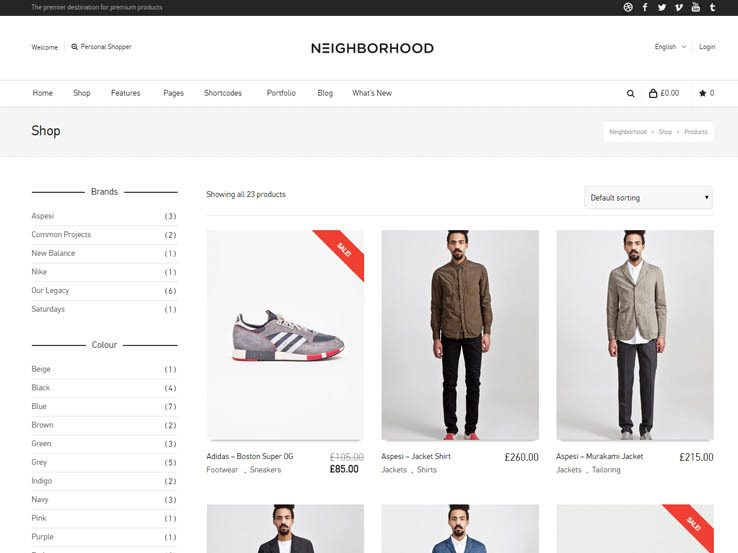 The Neighborhood theme comes with a clean and professional design along with a powerful feature-set to help you sell anything online. It includes a full-width slider that you can use to highlight particular product categories, a powerful search function, and a wishlist feature that lets customers add products to their accounts and purchase them later. The catalog mode is useful if you’d like to display certain products without actually selling them while the product image zoom feature allows potential customers to have a closer look at your products when viewing them. Furthermore, this template is fully responsive, which is vital considering many online shoppers are on mobile devices nowadays. 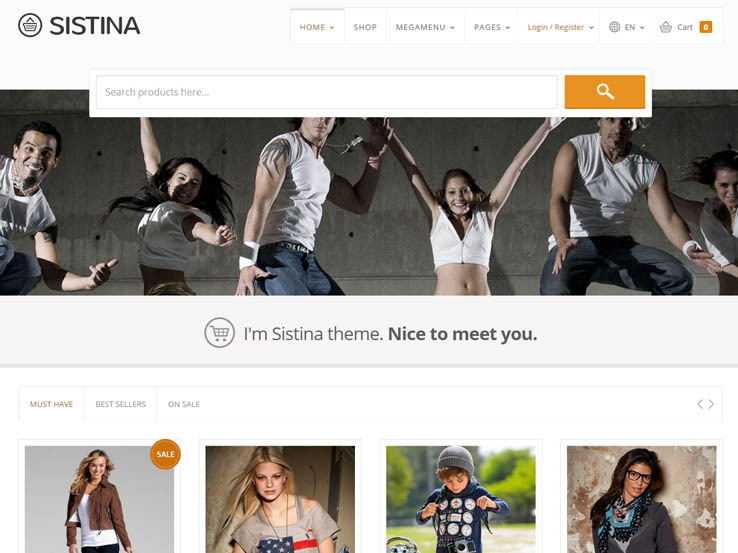 The Sistina theme comes with lots of incredible eCommerce features including product comparison, wishlists, pop ups that put your offers front and center, product image zoom, and product enquiry forms for customers to easily request more information about your products. Besides, you can display your products in list view or grid view. The autocomplete search function allows users to find the products they’re looking for much faster while the attractive sliders are great for highlighting your bestsellers, featured products, top rated products, and more. Also, your customers will have the ability to track their orders, and you can reach them in their own language since this theme is translation ready. 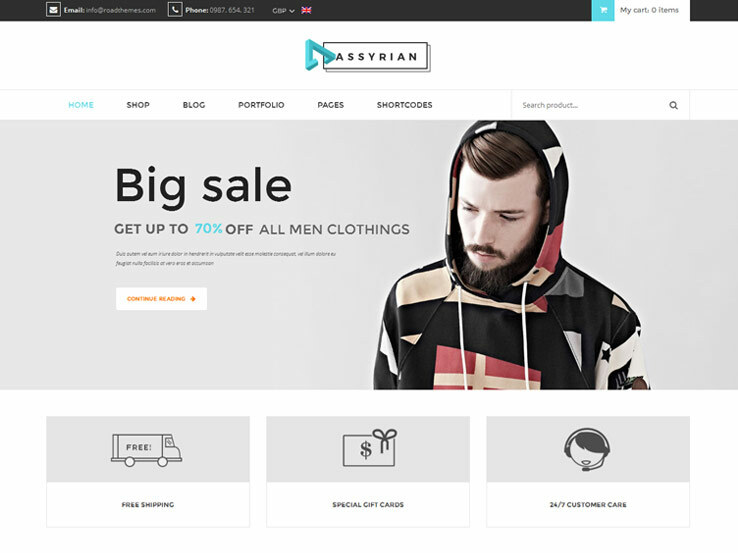 Meet Assyrian, a stylish and versatile eCommerce theme designed for fashion stores. It comes with multiple front page layouts to choose from, a shopping cart to handle the shopping process and big and beautiful sliders to showcase your products. Use the products slider to display all kinds of products; from new and featured to best-selling and top-rated products. The flexible product image zoom feature will help potential customers take a closer look at your products before purchasing, and you can also display customer reviews to boost your sales. Besides, the template includes a brand logo slider for displaying the brands you sell, wishlists, and static banners to add variety in the way you present your products. 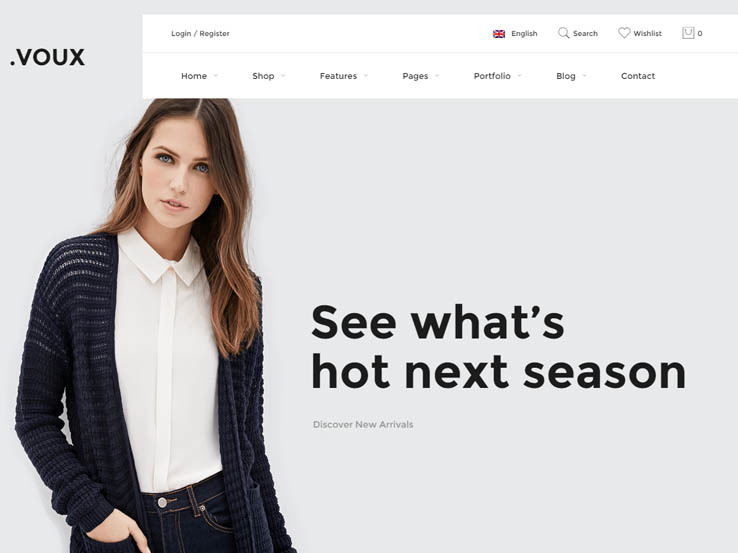 The Nantes theme makes a great choice for online fashion and beauty retailers; although it can still be used to build just about any kind of eCommerce site. It integrates nicely with the WooCommerce plugin, giving you access to lots of powerful and user-friendly eCommerce features such as a shopping cart and payment processors. This template features large and attractive banner areas for displaying your products, wishlists for users to save collections of their desired products, and the ability for customers to display their orders. Also, there’s an advanced review system so customers can leave feedback on products they’ve used before, a drag and drop page builder to help you create page layouts without coding, and social links to help grow your store through social media. 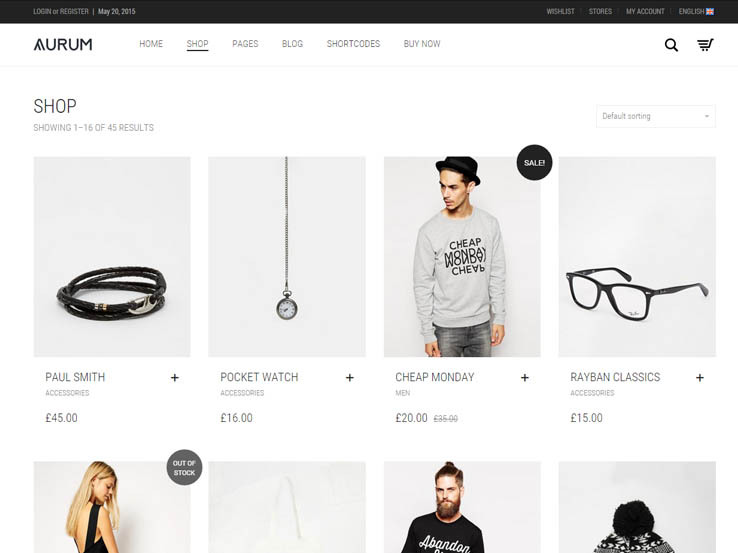 The Room 09 Shop theme is a stylish and modern eCommerce template powered by the WooCommerce plugin. It’s packed with incredible features and functionalities including a wishlist and product comparison module, a pop up to show your offers and news, a full screen slider background that you can use to showcase product photos, multiple payment options, user accounts and order tracking capabilities. Site visitors can use the product image zoom feature to view products closely or contact you through the product enquiry form to seek more information about a product. Also, the template comes with 2 thumbnail layouts and 2 product page layouts, giving you a variety of ways to present your products. 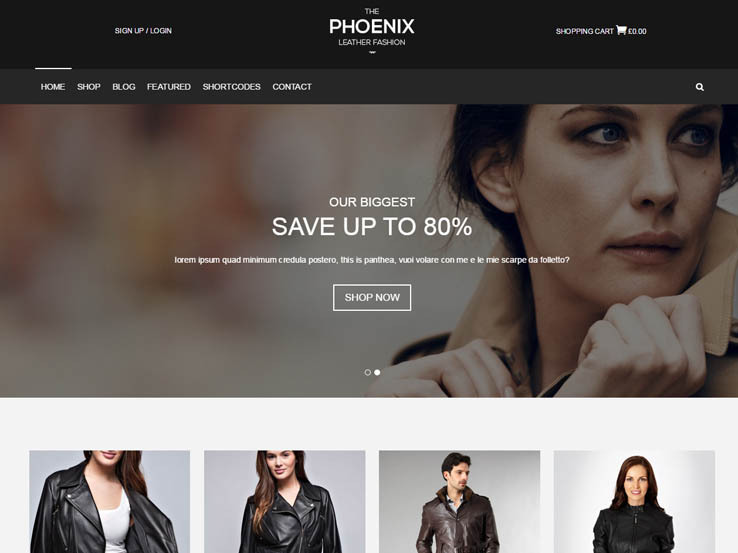 With the Phoenix theme, you get a clean and modern solution that’s perfect for creating an online fashion store. It features an attractive full-width slider on the front page for highlighting your best products and a large logo area at the top to help enhance your branding. The template is image-friendly, providing you ample space for presenting your product photos. Besides, you’ll find a neat blog section to share your knowledge and attract more traffic to your online shop from search engines and social networks. And since the Phoenix theme is fully responsive and translation ready, all your customers will enjoy a smooth shopping experience regardless of which device they’re on or which language they understand. 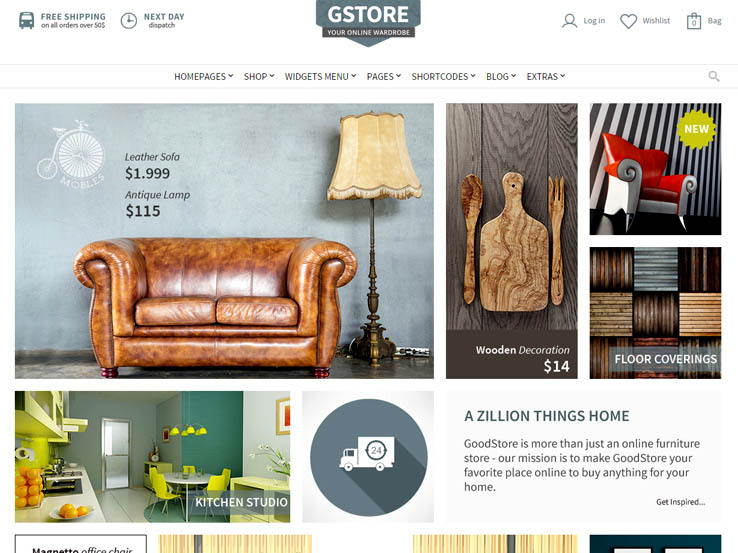 Goodstore is a fast and flexible theme built with the WooCommerce plugin. Use it to create a modern and beautiful online store that’s easy to manage and customize to your liking. To start with, it comes with multiple homepage variations, and you can also create your own custom page using the drag-and-drop page builder that doesn’t need coding knowledge to work with. You’ll find large front page banner sliders to highlight your products and draw in visitors, attractive banner areas for displaying product photos, as well as a reviews and ratings system so customers can leave feedback on the products they’ve used. In addition, the theme supports wishlists and offers different product box styles, giving you a variety of ways to present your products. It also integrates nicely with social media sites and includes a simple blog that you can use to attract traffic to your store. 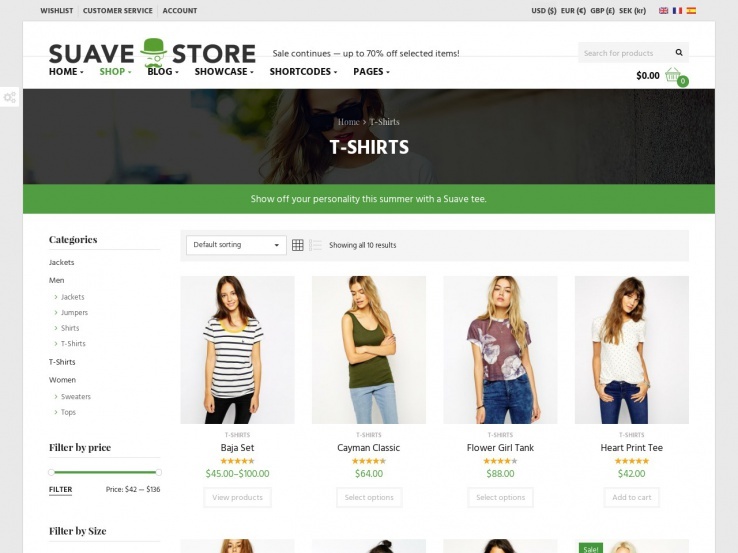 The Stored theme is an awesome choice for those looking to have a simple and secure eCommerce shop that puts their products front and center and helps them make more sales. Based on the Cart66 WordPress eCommerce solution, the template comes with lots of in-built eCommerce features such as a shopping cart to handle the shopping process, various payment modes, and image galleries for showcasing your products. We like how secure the template is, since it’s PCI compliant and it does not require you to purchase your own SSL certificate to start securely accepting payments. Also, the Stored theme is super easy to work with and you won’t need any coding knowledge. Simply upload a product on a page and you’re ready to sell. 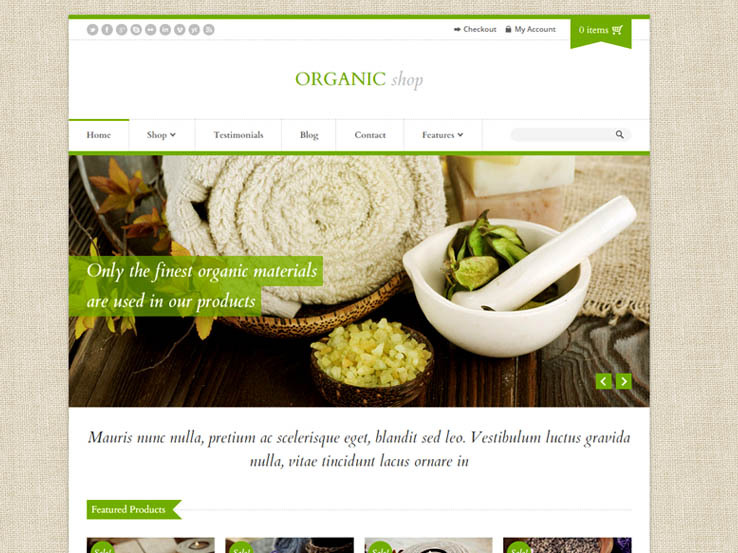 The Organic Shop theme is a great choice for online shops selling organic, spa and beauty related products. It uses the WooCommerce plugin, meaning you get a powerful feature-set that includes the ability to add multiple product images and display related products on product detail pages, multiple payment options, and a product reviews module for customers to leave their feedback on the products they’ve used. Besides, customers can login and track their orders for peace of mind. You’ll also be able to provide coupon codes to your customers and offer them various shipping options to choose from. Last but not least, the Organic Shop theme is translation ready and it comes with a user-friendly options panel so you can easily configure your website. The Porto theme is an incredibly beautiful option for those looking for variety and ease-of-use in their online shop. First, it comes with over 10 pre-made shop layouts to choose from, giving you a variety of ways in which to present your products and saving your time when building your site. It uses the WooCommerce plugin, which offers powerful and customizable eCommerce tools including payment gateways, wishlists, shipping options, and order tracking. Additionally, the template includes a reviews and ratings system to help build your credibility and a newsletter module so you can capture emails and send product news and offers to your customers and prospects. Also, the Porto theme is fully responsive to cater for shoppers on mobile devices and translation ready if you have an international market. 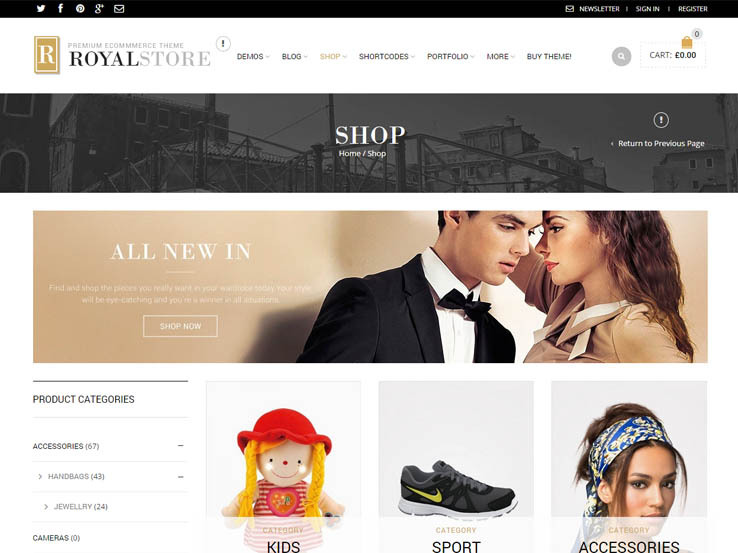 The Royal theme comes with several elegant eCommerce demo layouts, a shopping cart thanks to the WooCommerce integration, wishlists to allow your customers to save desired products for later purchase, and a newsletter subscription module to help with your email marketing needs. You’ll also find various payment gateways, shipping options, and order tracking features. Also, the Royal theme is mobile-friendly so online shoppers on smartphones and tablets will enjoy a smooth experience. And thanks to the advanced theme panel, configuring your website will be easy and enjoyable like a walk in the park. 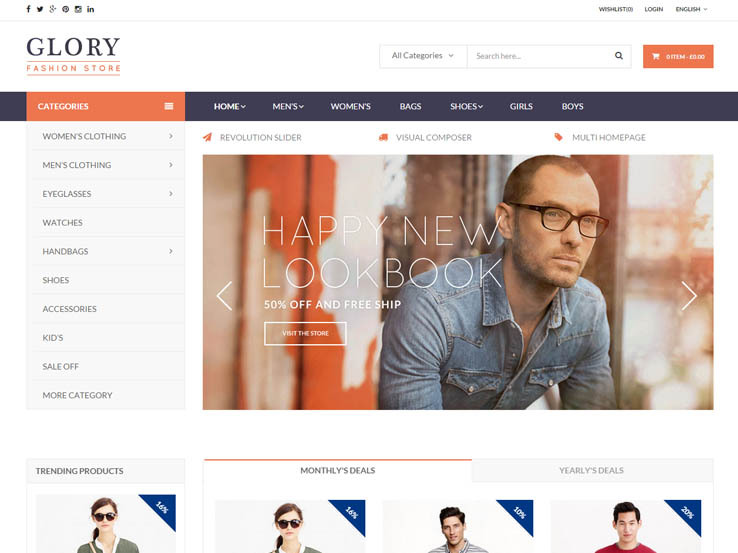 Glory is a clean and stylish eCommerce theme designed for online fashion stores. Still, you can use to build just about any kind of eCommerce site since it comes with several shop layouts and it’s highly flexible. It integrates perfectly with the WooCommerce plugin, providing you with all the features you need to successfully start an online shop. You’ll find a shopping cart, payment processor, order tracking support, shipping options, and much more. Furthermore, the Glory theme includes a product comparison and a wishlist feature so your customers can easily research products and save them to their user accounts for later purchase. Also, this template has an order notification feature to provide you desktop prompts whenever you have new orders. Meet Pasar, an elegant eCommerce theme from TokoPress that aims to make it easy for anyone to own an online store. 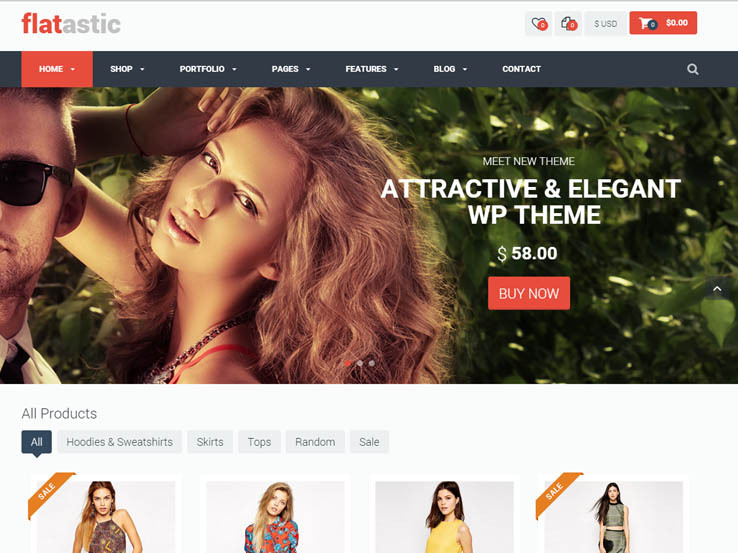 Like most WordPress eCommerce themes, this template works with the WooCommerce plugin. This means you’ll have access to a wide range of powerful and customizable eCommerce features such as product variation options, product sliders and carousels, shopping cart, compare and wishlists, payment gateways, order tracking, and more. The Pasar theme also includes an email subscription module so you can collect emails and send out offers, discounts and updates. Moreover, you’ll find an elegant blog section to share updates and help attract more traffic to your online shop. 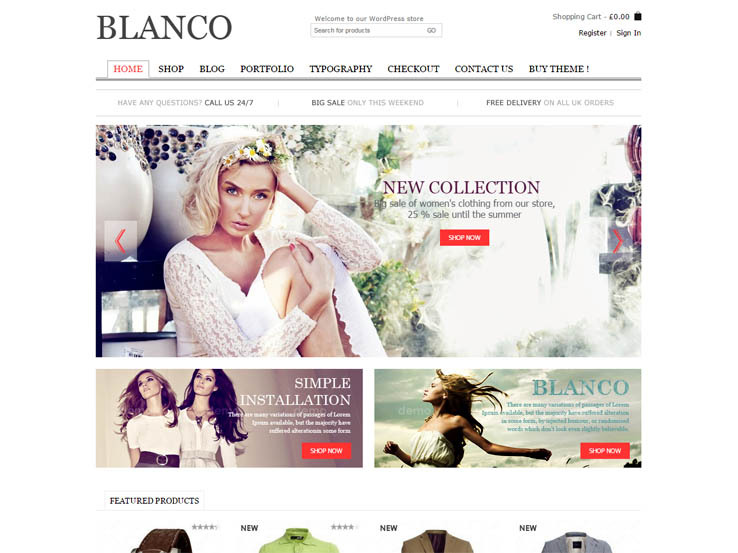 Designed by the folks at 8themes, Blanco is a powerful and flexible WordPress eCommerce theme. It’s suitable for creating an online clothing, apparel, or fashion store. The front page includes a large and attractive slider as well as product carousels for displaying featured products and the latest additions to your store. Additionally, this template lets you present your store in a variety of languages and currencies, allowing you to target different localities around the world. You’ll also find lots of color and background options to help with your branding, and a powerful admin panel to easily configure the theme. 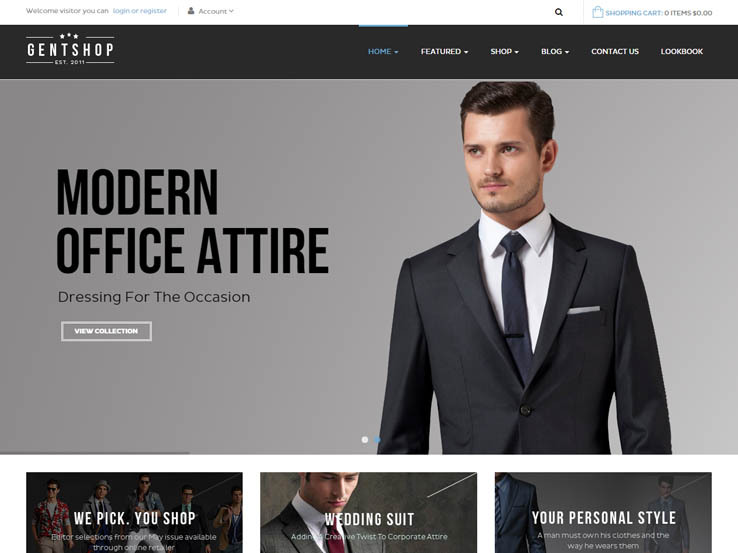 The GentShop theme by the Opal Team is a great option for online fashion stores looking for a classic way to present their shop. It comes with product sliders and carousels for highlighting your products, support for different product types, and a look book page for displaying your product collections. Your customers can create wishlists of desired products for later purchase or quickly compare products before purchasing. There’s also a Quickview feature that provides quick product overviews to the customers. 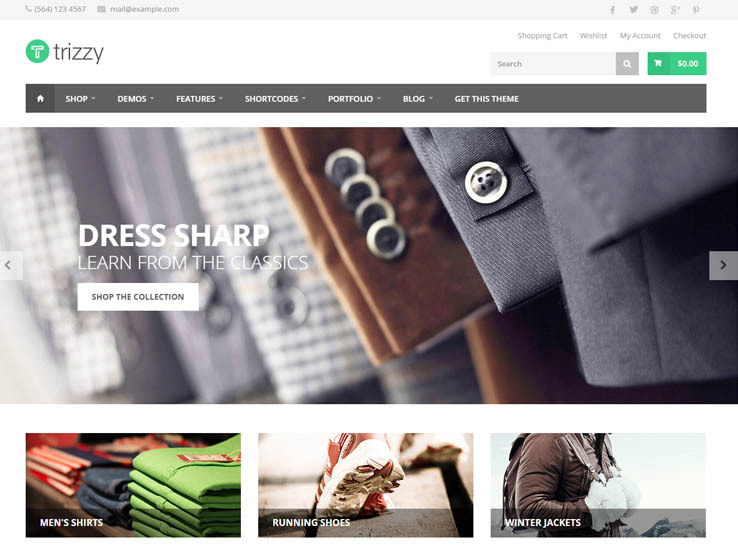 In terms of options, the GentShop theme comes with 3 demo layouts to choose from and a user-friendly page builder to easily create your own custom layouts, unlimited color variations, and a powerful customizer for configuring your site. Do you sell thrifty products, handmade or craft goods? If yes, then you might want to check out the Olea WordPress theme. This template comes with a clean and refreshing design along with some powerful eCommerce features and functionalities. You’ll find a look book page for presenting your product collections, an Ajax-powered product search module that lets customers find the products they want much quicker, and a wishlist that will help build customer loyalty and boost your sales. The template comes with various pre-made home layouts and 6 header variations to choose from, allowing you to build your store faster and give it the look you want. Also, the Olea theme integrates nicely with Mailchimp, making it easy for you to grow your business through email marketing. And since the template is translation ready, you can easily reach your customers in the language they understand. The Zonker theme comes with 4 homepage layouts, the option to present your products in list or grid view, and beautiful product sliders to display your best-selling, featured, top-rated, and new products. The add-to-cart, wishlist and comparison modules are powered by Ajax, which means customers can quickly add products to their shopping carts, save them to their wishlists, or compare different products without loading new pages. The Quickview feature provides product overviews when customers hover over product images while the image zoom feature allows customers to have a closer look at products. Moreover, you’ll find a brand logo slider to display brands of the product you sell, a blog to help generate more traffic to your store, and a contact form so people can easily get in touch with you. Aurum is a beautiful and flexible eCommerce theme that’s perfect for those who want to put their products front and center without all the clutter that comes with most WordPress themes. It works well with the WooCommerce plugin, providing access to many eCommerce features including wishlists, order tracking, Ajax-powered add-to-cart functionality, and support for different product types. The template includes a custom search page with content filtering so that customers can quickly find the products they want, custom widgets and shortcodes to easily add products to your shop, and social media integration to supercharge your marketing. Other notable features include multi-language support, a drag-and-drop page builder, and a responsive design that looks awesome on any device and screen size. 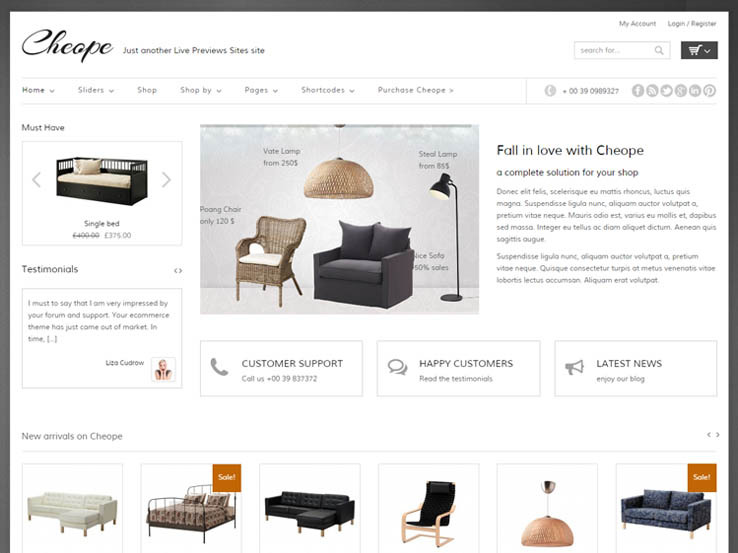 Cheope Shop is another clean and versatile eCommerce template on our list that uses the WooCommerce plugin. It comes with product sliders, a zoom effect to allow customers a closer look at products, 2 custom checkout pages, and a pop up for displaying your offers. Besides, the template includes a “catalog mode” that lets you list your products without the shopping cart, which is quite handy when you run out of stock. Also, you’ll find a testimonials module to help increase your credibility and boost sales, a filterable FAQs section, shipping options, and order tracking to keep your customers in the loop about their orders. Looking for an elegant solution to sell your products online? 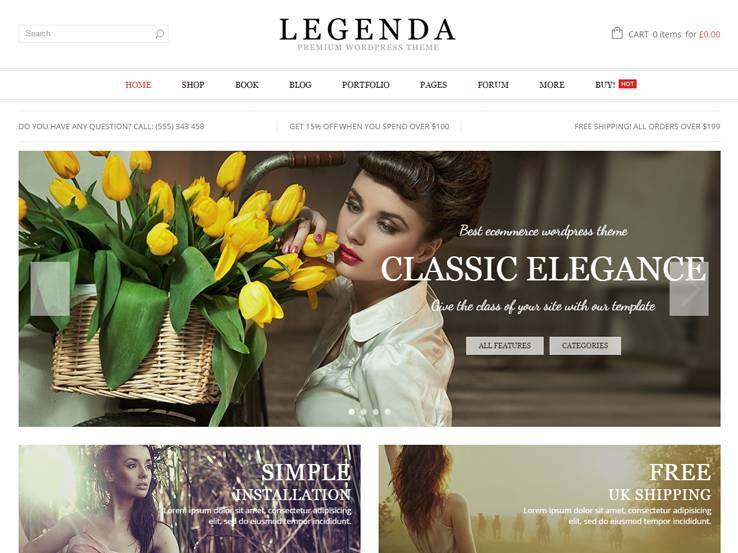 Try Legenda, a clean and powerful eCommerce theme with full WooCommerce integration. It offers a ton of awesome features such as an improved checkout process to minimize cart abandonment, multiple shop layouts that allow to display 5, 4, or 3 products per row, a testimonials widget to easily add customer feedback and boost sales, and an Ajax product filter that lets customers find products much quicker. Furthermore, this template allows you to add video product presentations so you can add depth to your product details page. You’ll also find an advanced admin panel for configuring the theme, product image hover effects, custom headers, and unlimited color variations to help with your branding needs. 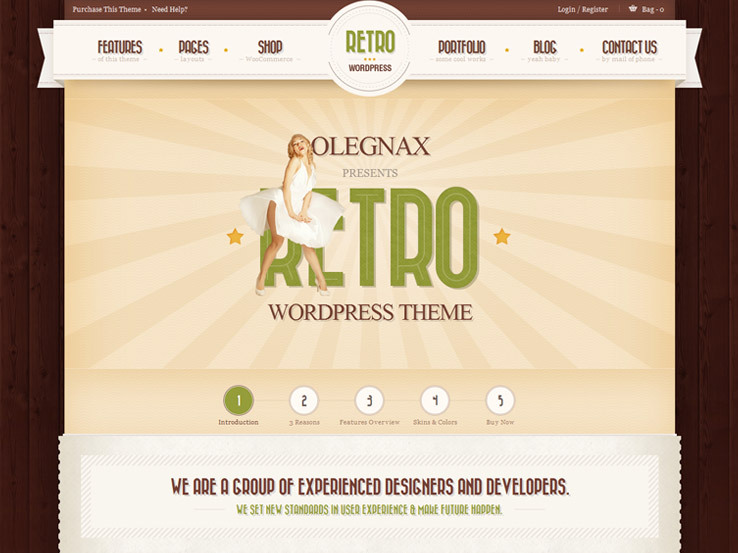 The Retro theme provides a classic design and lots of useful eCommerce features. It comes with a powerful wishlist module that allows customers to create an unlimited number of wishlists and has in-built analytics so that you can monitor and understand what your customers desire. Multiple shop layouts are included to give you a variety of ways in which to present your products. The advanced grid system lets you set the amount of products you wish to display per row. The template includes product carousels for displaying products more attractively, image hover effects to increase customer interest in your products, and a contact form so that customers can quickly get in touch with you. Also, the Retro theme includes a blog, multi-language support and social media integration to help increase your store’s visibility. Trizzy is an excellent WordPress template with a stylish design and full WooCommerce integration, giving you access to some powerful eCommerce features and functionalities. To start with, it comes with an advanced search module that includes an autocomplete feature and the ability to filter products by their attributes such as color and size. The large front page slider and the product carousels offer a great way to feature your best products and new arrivals, and you can use the attractive static banners to display your offers. Use the clean and elegant blog to share updates and attract more people to your shop. The reviews and ratings system provides a way for your customers to leave feedback on the products they’ve used, which will boost your credibility and sales. Additionally, the Trizzy theme comes with a newsletter subscription module to use for your email marketing needs. 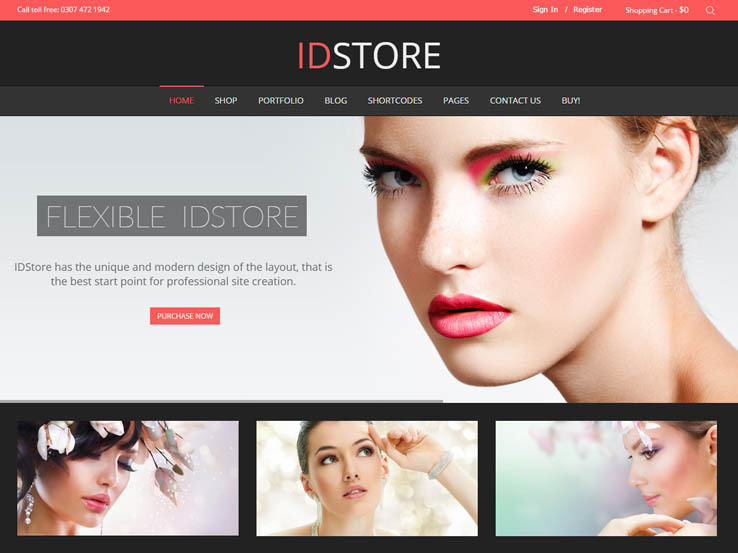 IDStore is a powerful and flexible eCommerce theme powered by the WooCommerce plugin. It comes with multiple shop layouts with dark and white variations, giving you a wide selection to work with. The elegant product sliders and carousels are great for showcasing your featured and latest products. Besides, the template features an Ajax-powered filter, which is ideal for online stores with lots of products as it allows customers to quickly find the products they’re looking for. You can turn your store into a catalog thanks to the “catalog mode” feature that disables add-to-cart buttons and prices. Furthermore, the theme uses an improved checkout process to reduce shopping cart abandonment and an advanced grid system that allows to display from 3 to 6 products per row. Other theme features include a responsive design to cater for mobile users, custom product page layouts, unlimited color options, and multi-language support so you can easily turn your store into a different language. 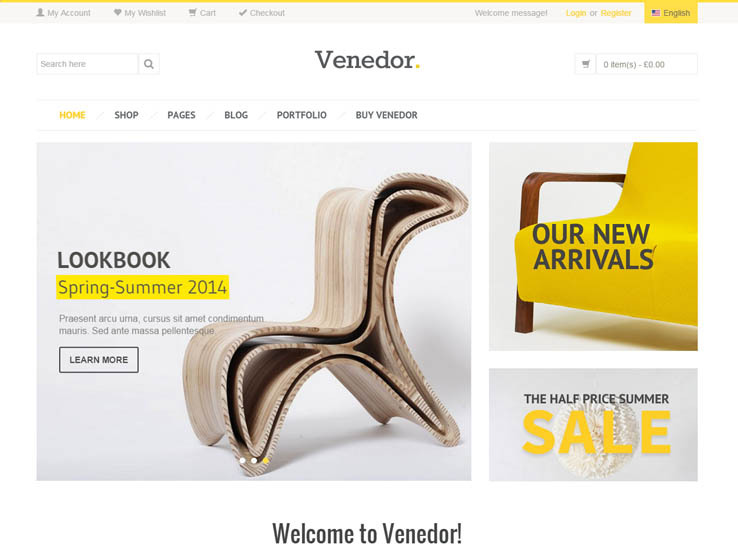 Consider the Venedor theme if you’re looking for a feature-rich eCommerce template that’s highly customizable and super-easy to use. It comes with many cool features to successfully start your online store including the option to present your products in grid or list view, wishlists, and product comparisons to help customers select the best products for their needs. The advanced zoom and the quick view function help customers research products faster, while the “Hot” and “Sale” product labels help boost your sales. Besides, the Venedor theme comes with several beautiful sliders and banners to present your product photos, a mobile-friendly design to cater for shoppers on tablets and smartphones, and social sharing functions for people to easily share your products on social media. 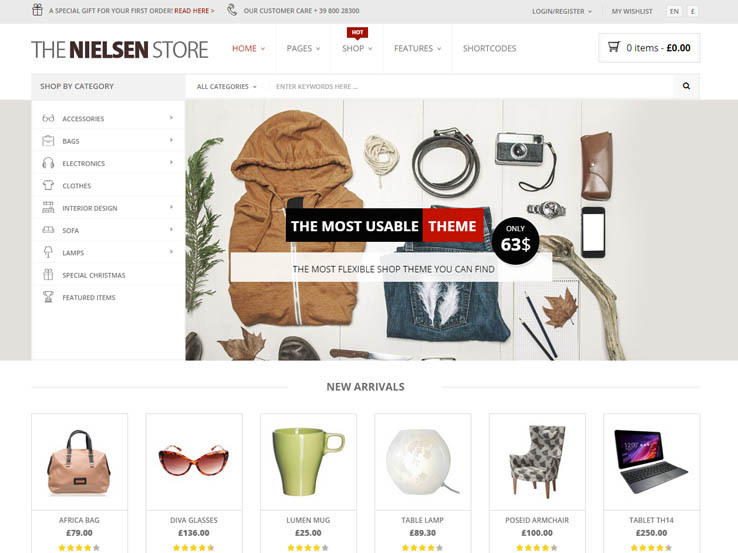 Nielsen is a modern and intuitive eCommerce theme focused on providing the best shopping experience for your customers. It comes with all the features you’d need to a sell any kind of product online including 12 home layouts, an advanced search function to help customers quickly find the products they’re looking for, a look book page for displaying your collection of products, and a pop up that will ensure no one misses your offers. Customers can inspect products much faster using the quick view feature, compare different products, or save products to their wishlists for future purchase. Additionally, this template features an advanced reviews and ratings system as well as the ability to add product variations such as color and size. 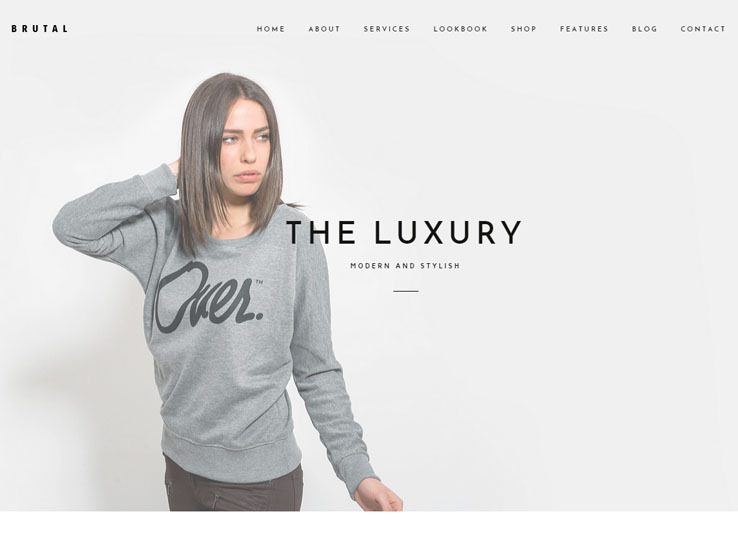 Oxygen is a clean and minimalist WordPress eCommerce theme powered by the WooCommerce plugin. It offers several shop layouts that are designed to put your products front and center and boost your sales, support for various payment methods, order tracking, shipping options, and elegant product carousels that will make your online shop more attractive. The wishlist module will help increase sales and customer loyalty as it allows people to save the products they desire and buy later, while the catalog mode will prove useful whenever you run out of stock but still want to list the products you deal in and keep customers in the loop. You can easily localize this template since it’s translation ready. Other features include the responsive design, social media integration, and a blog to help generate more traffic to your online store. Looking to launch an online fashion store? 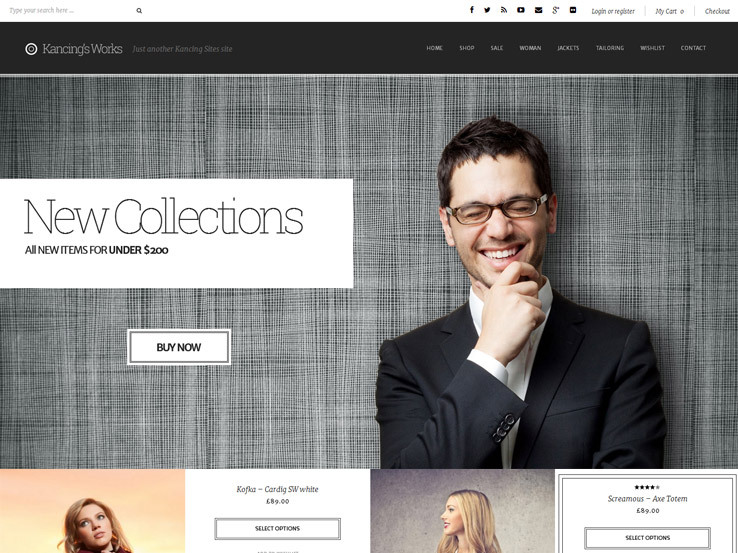 If yes, consider the Clothes Shop WordPress theme. This stylish template comes with a large and beautiful full-width front page slider to feature your best products, lots of attractive banner areas for displaying your product photos, and a lookbook page for showcasing your product collections. You’ll find a reviews and ratings system for customers to leave their feedback on the products they’ve used, a blog to help generate more traffic to your store, and social media icons so that people can easily follow and share your content. Also, the theme supports different payment methods, video content, product categories, and product filtering to help customers quickly find the products they want. 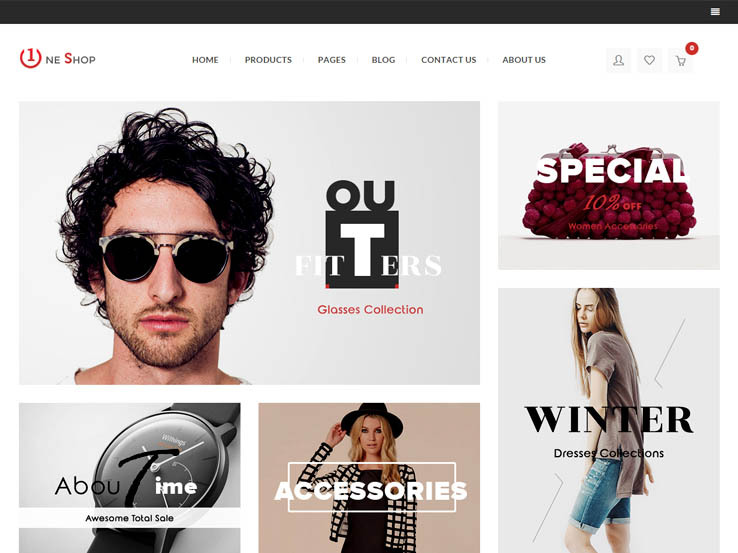 Voux is another clean and modern fashion store theme on our collection. Powered by the popular WooCommerce plugin, this template brings a ton of eCommerce features such as inventory management, wishlists, an order management suite, coupons, and support for a wide range of payment gateways. Furthermore, the Voux theme comes with in-built analytics to help you monitor the performance of your store, tax management for any regions and countries, and over 15 custom widgets to easily display things like your best-selling, latest, or top-rated products. You’ll also find several homepage layout styles to choose from, a newsletter subscription module, social media links, and much more. 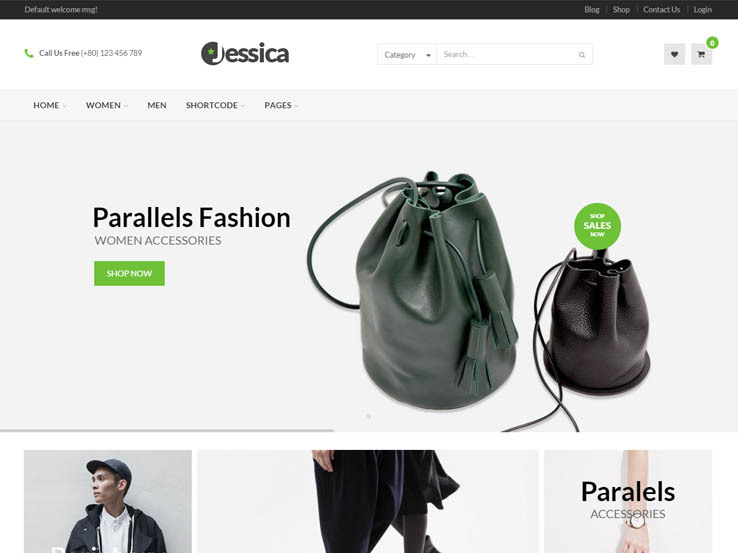 Developed by Web Savvy Marketing, Jessica is an elegant and flexible eCommerce theme that’s compatible with 3 popular WordPress eCommerce plugins – WooCommerce, iThemes Exchange, and WP e-Commerce. With this template, you get a professional design and plenty of features and options to create your online store. You’ll find several different payment methods, shipping options, beautiful banners to show off your product photos, product ratings to increase sales, and much more. Use the email subscription module to collect customer emails and supercharge your marketing, and the blog section to share your knowledge and attract people to your store. You can also add customer testimonials for social proof, or easily translate your site into the language your target market understands. 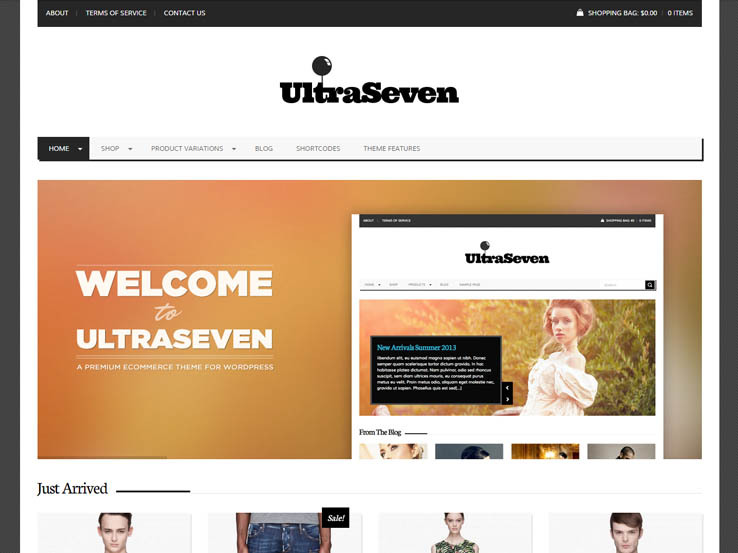 UltraSeven is a beautiful and versatile theme that can be used to build a unique online shop. Developed by the CssIgniter team, it integrates nicely with the WooCommerce plugin, allowing you access to lots of powerful eCommerce features such as product variations, payment gateways, tax management, wishlists, and product comparisons. Customers will be able to create their user accounts and do things like order tracking or saving products to their wishlists for later purchase. Moreover, the UltraSeven theme comes with beautiful sliders to highlight your products, a drag-and-drop page builder to easily create custom page layouts without coding, and social media integration so people can easily follow you and share your products. 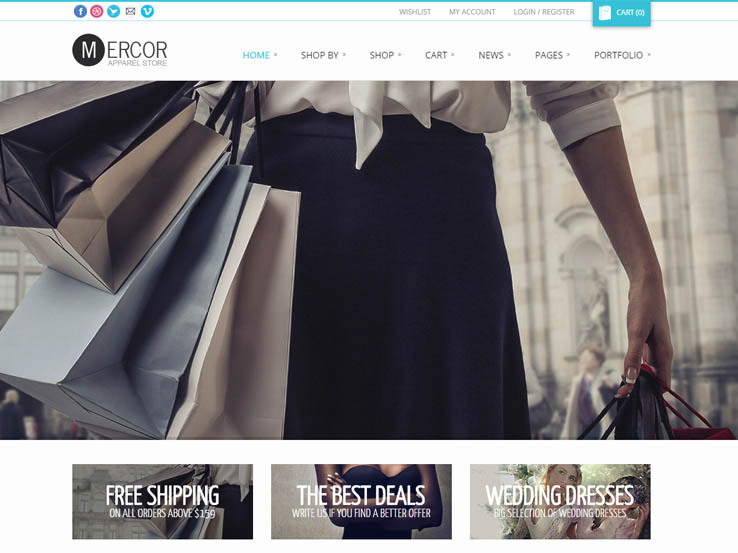 Mercor is an awesome eCommerce theme powered by the WooCommerce plugin. To start with, it features large front page full-width slideshows with video support, an intuitive shopping cart, and several homepage layouts to choose from. Customers can easily access their wishlists and user accounts from the top section, which also features social media icons so people can easily follow you. The product carousels are great for presenting your latest arrivals and featured products, while the image zoom function will allow customers a closer look at your products. And since the template is fully responsive, your customers will enjoy a seamless shopping experience whether they be on smartphones, tablets, or large desktop screens. 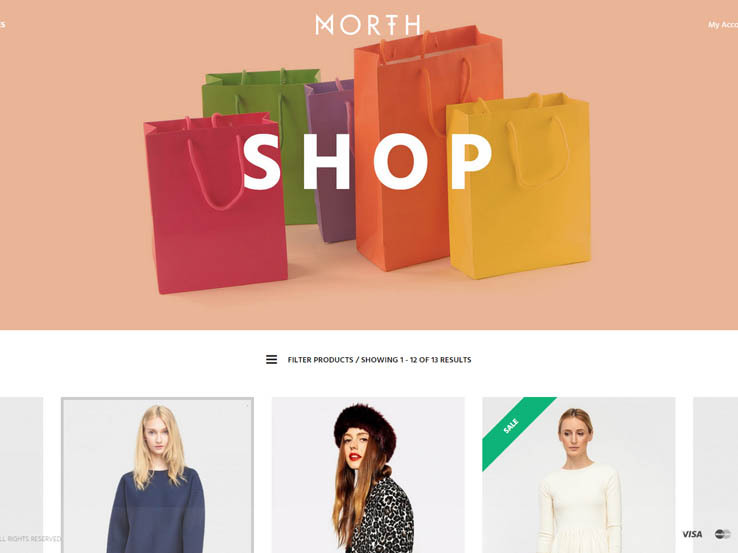 North is a modern flexible eCommerce template designed and developed by Fuel Themes. It brings many features and options including pop ups to make your offers unmissable, innovative homepage layouts that are designed to increase conversions, a currency switcher, shipping options, and product filters so customers can quickly find the products they specifically want. You’ll be able to easily prepare PDF invoices, offer dynamic pricing and discounts, or translate your online store into other languages including right-to-left languages like Arabic. Also, you can easily customize every aspect of this template to match your needs, build custom page layouts using a drag-and-drop page builder, and generate more traffic to your shop using the clean and simple blog. 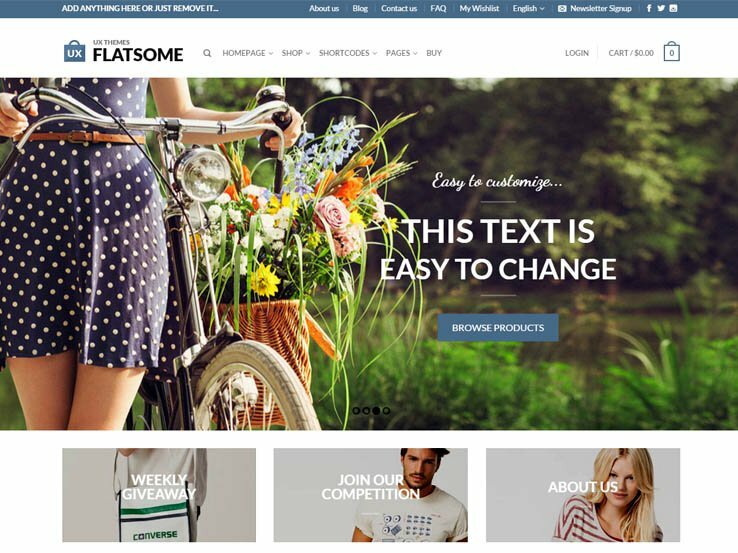 Flatastic is another clean and versatile WordPress theme powered by the WooCommerce plugin, making it a powerful option to launch your online store. It comes with several home layouts, multi-vendor support so you can allow other sellers to setup their own shop on your website, several interesting header designs to add to your styling options, and an advanced pop up module that lets you target specific segments of your market. In addition, the Flatastic theme makes it easy for you to run product deals with countdown timers that help boost sales. It also comes with an Ajax-powered shopping cart for a smooth shopping experience, wishlists, product filters to allow customers find the products they want much quicker, and multi-currency support so you can easily add your own currencies. 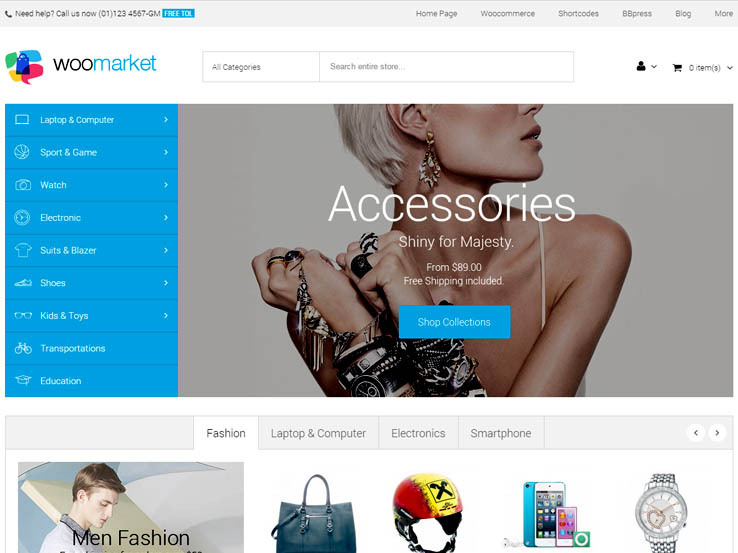 WooMarket is a WooCommerce compatible theme that comes with a wide range of features and functionalities. It includes several pre-made shop layouts, product countdown timers to boost sales, wishlists to increase customer loyalty, and a quickshop feature that lets your customers quickly view any product while browsing a category or a product listing page. In addition, the WooMarket theme features an Ajax search function that lets customers quickly find the products they’re looking for, a testimonials module to increase social proof and sales, and an email subscription form to help with your email marketing efforts. Other features include a responsive design, multi-language support, social media integration, mega menu support, and much more. 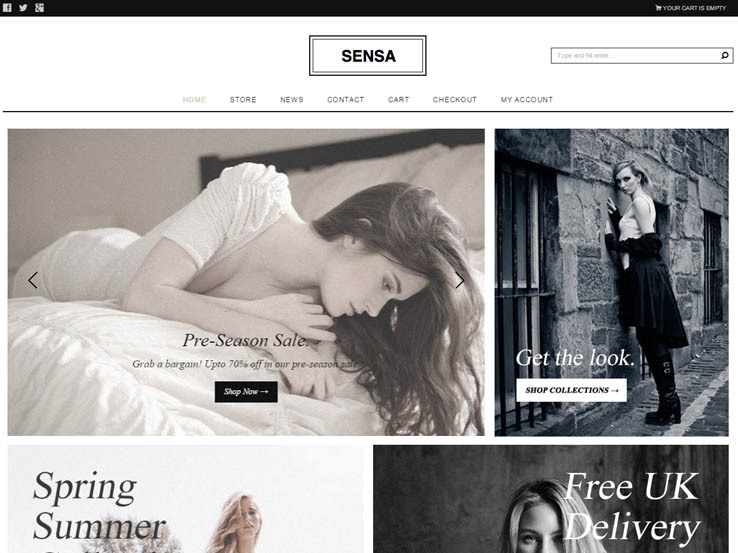 With the Sensa theme, you get a beautiful, responsive solution for your eCommerce site. It comes with an attractive slider for highlighting your best products, order tracking ability, optimally placed social media icons so people can easily follow you, and an email subscription module to capture customer emails and boost your marketing. The image-friendly design allows you to show off beautiful photos of your products and arouse customer interest, while the included translation files means you can easily translate your store into your own language. Besides, you’ll find unlimited color options for branding, and SEO-friendly code so you can easily rank in search engines and attract relevant traffic to your online store. 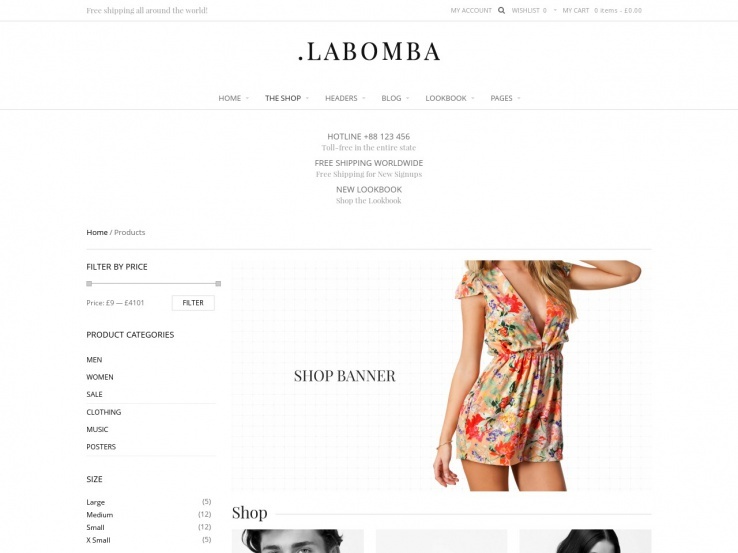 Consider the Labomba theme if you’re looking to launch a fashionable online store that stands out from the rest. It comes with an elegant photo-friendly design along with a wide range of customizable eCommerce features. It includes a nifty quickview feature that’ll enhance user experience, a wishlist with social sharing ability, and an attractive lookbook page that can be customized to match your brand. The product detail page comes with two layout options, giving you variety in the way you present your products. In addition, you’ll find a zoom function that allows customers a closer look at products, product sliders, social media integration, unlimited color options for branding, and an Ajax-powered search function so customers can quickly find products. 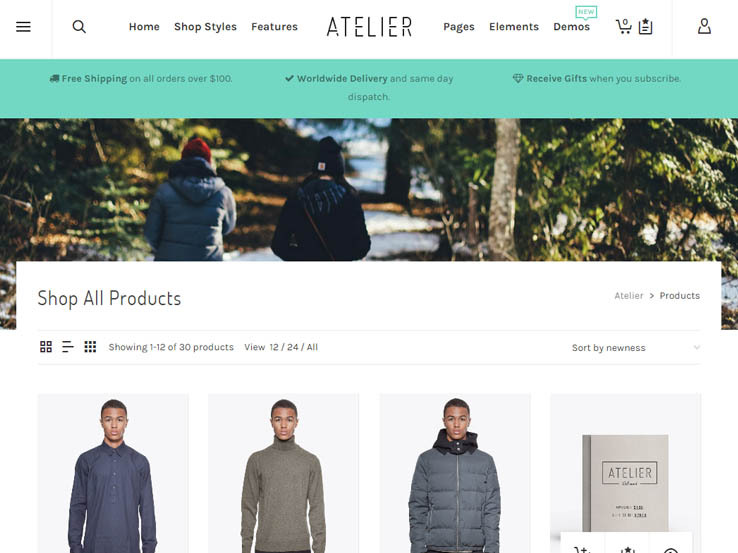 Designed and built by the SwiftIdeas team, Atelier is a classic eCommerce theme with all the features and options needed to start a successful online shop. It provides over 14 home layouts to choose from, the ability for users to choose how they’d like to view your products, 3 product page variations, and an enhanced shopping cart and add-to-cart process for a smooth shopping experience. You’ll find 4 product display types each with lots of options, a drag-and-drop page builder to easily create custom page layouts without coding, product sliders and carousels, a reviews and ratings system, a blog to share your updates and generate more traffic, and social media links so people can easily follow you and share your products. Furthermore, the Atelier theme includes an email subscription function so you can easily start doing email marketing. 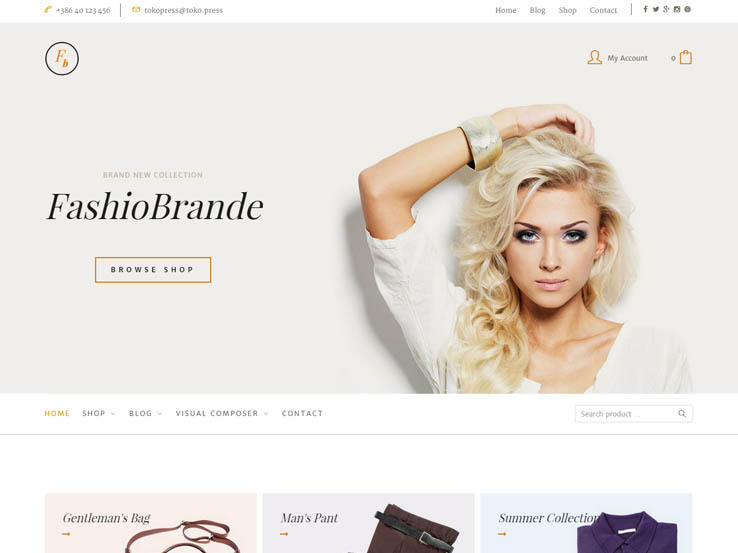 OneShop from the team at WpStoresNet is a beautiful eCommerce theme with the flexibility to handle any type of online sale with style. It’s a fabulous option if you’re looking to build a clothing store, electronics shop, boutique jewelry outlet or any other product type you could think to throw at it. Seeing is believing so look at these awesome demos to understand what I mean. It’s also highly customizable for a clean and minimal look, and also includes some flat design features. This theme offers six product box styles and six category page styles for an awesome range of options when it comes to the way your inventory is displayed. Site management is easy with OneShop, which comes with a built-in backend configuration system that takes care of many setup and display tasks. You can seamlessly implement and maintain a newsletter system that integrates with MailChimp, a widget builder for building custom headers and footers, a social media builder to connect with your customers, and a live preview system for typography changes. The Store Box theme is a perfect choice if you’re looking to put the main focus on your product. WooCommerce integration makes uploading images and creating product details a cinch; you can also easily create a mega sale or special promotion. The super clear side menus and cart that moves along with you make shopping on your site incredibly easy. The parallax capability, which is used sparingly in the demo, will add some pizazz to your site while the grid layout looks great on phones and tablets. The demo site looks amazing but you can also customize it with plugins and fonts to add your own branding touches and be up and running as quickly as possible. If you’d like a theme with an abundance of white space, think about buying the Mantel theme by Tokokoo. The huge image slider is ideal for showcasing anything from clothing to jewelry and the translation options allow you to easily build an international store. The theme comes with Google Maps integration to display the physical location of your store. The contact form helps customers get in touch with you if they need help and various widgets are perfect for including ads, a Twitter feed, or even a list of your most recent posts. The theme also includes unlimited color and font choices so you can easily integrate your branding. Great article! Needed one hour to read this humongous blog. I would love to make a help though. Just recently bumped into this free ecommerce theme which I believe would be perfect fit for this great post. Thanks for pointing this theme out to us. We appreciate the suggestion. Your welcome, glad you liked it. What is your favorite feature of Accesspress? I’ve bookmarked your website, you’re doing great, thanks for sharing these attractive themes.